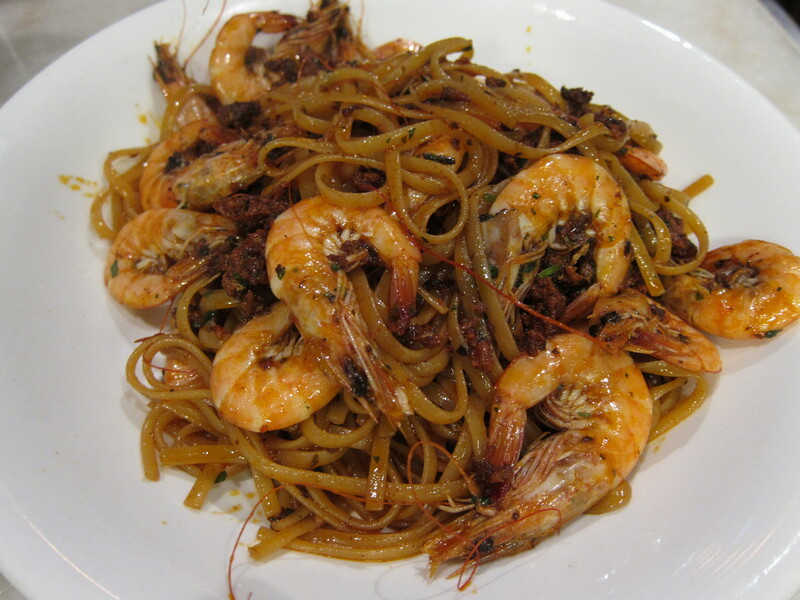 Simple eats are invariably the most satisfying and that’s what mother and daughter-owned The Pasta Place in Sheung Wan aims to do by going back to basics and providing hearty pasta dishes and desserts in a home-style setting. Despite owner Andrea Wannop being a Brit, her love of NYC and cooking Italian-American dishes inspired her and her daughter Charlotte to open their own establishment. 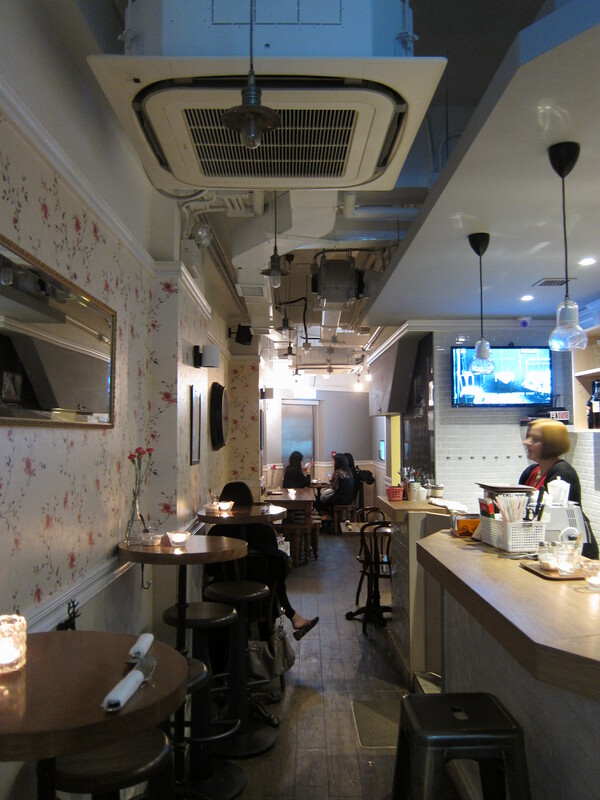 The Pasta Place is cosy, small and decorated with vintage wallpaper and black and white photos. 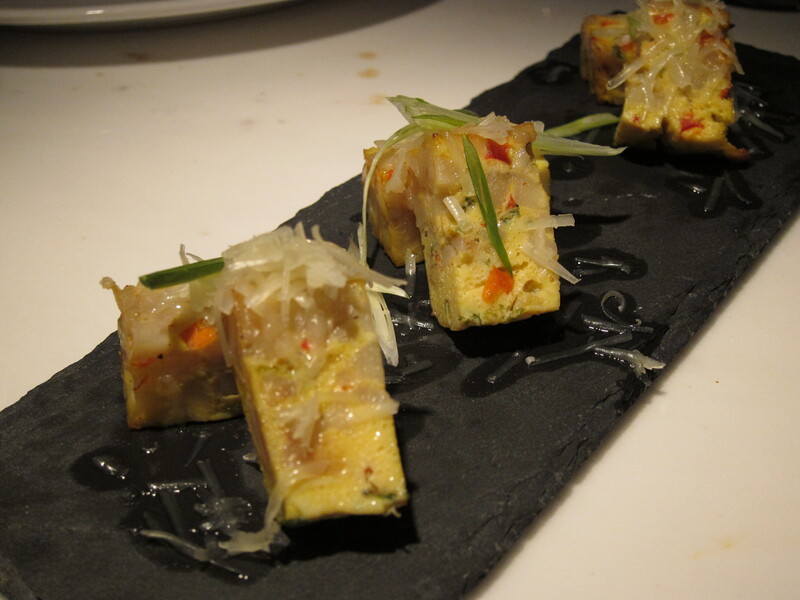 A compact selection of Appetisers, Small Plates for sharing, Sandwiches and Pasta dishes grace the menu, though of course, it is the pasta that one would be most interested in. All the pasta sauces are Andrea’s own recipes and if any of them tickle your fancy, you are in luck as they are now bottling and selling her sauces. 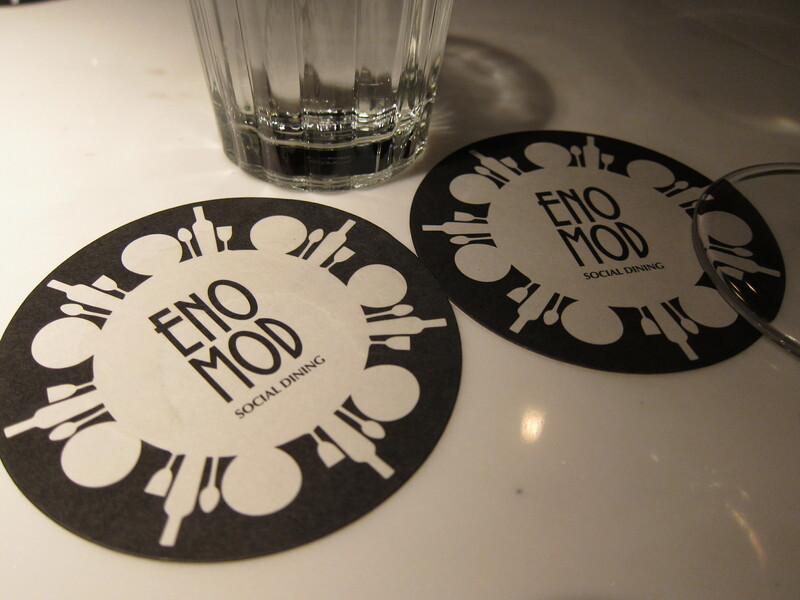 By kind invitation, my friend and I popped over one evening to try the food over a catch-up session. I started with a thirst-quenching homemade Mixed Berry spritzer before taking a forkful of their appetiser- Eggplant Parmigiana. The layers of roasted eggplant, mozzarella and pomodoro sauce came well together and I liked the burst of basil that came through. I would have preferred it if the eggplant could have been slightly more roasted but otherwise this was a lovely dish to begin with. We then chose to try their Small Plates selection (you choose three dishes to share for $70 per person) and opted for the Caprese Skewers, Italian Meatballs and Garlic Mushrooms. 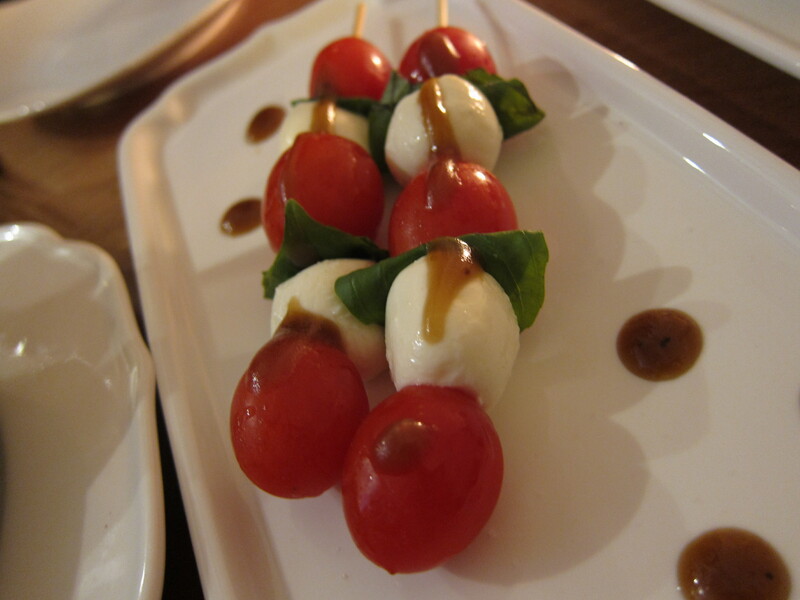 The Caprese Skewers were an uncomplicated combination of Buffalo Mozzarella balls, cherry tomatoes and basil. 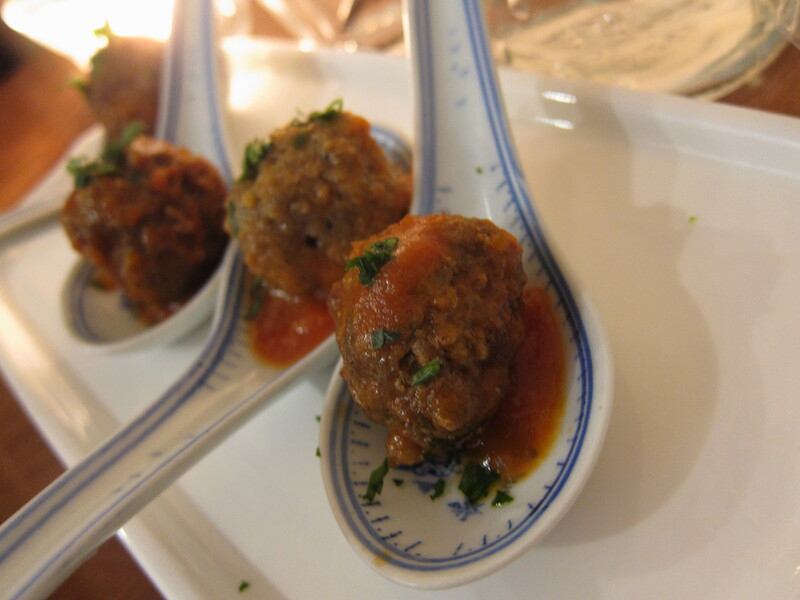 The Italian Meatballs were succulent and quite aromatic and I would have loved to have had them on a plate of spaghetti, which is sadly not offered amongst the pasta dishes! 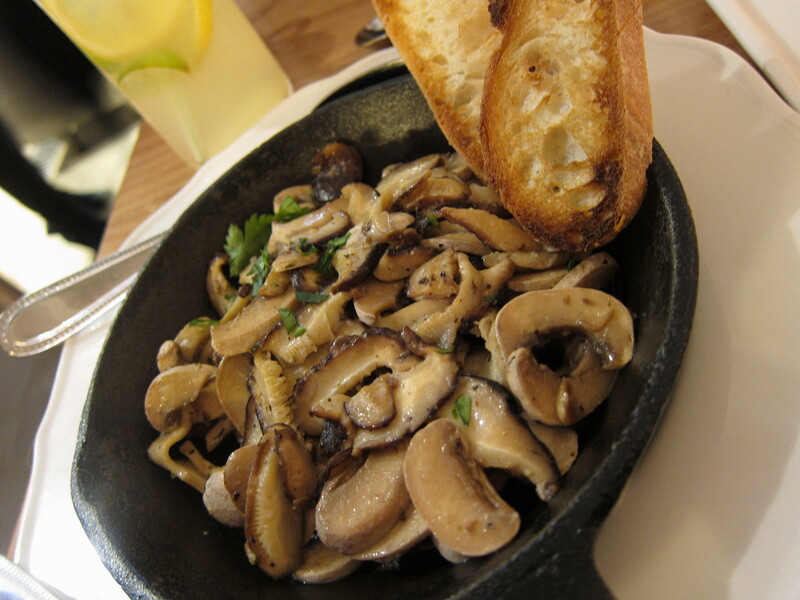 We also enjoyed the Garlic mushrooms which I do not recommend getting if you are on a date or going home to a loved one straight after, but if you are garlic fans like we are, then these will be right up your street. 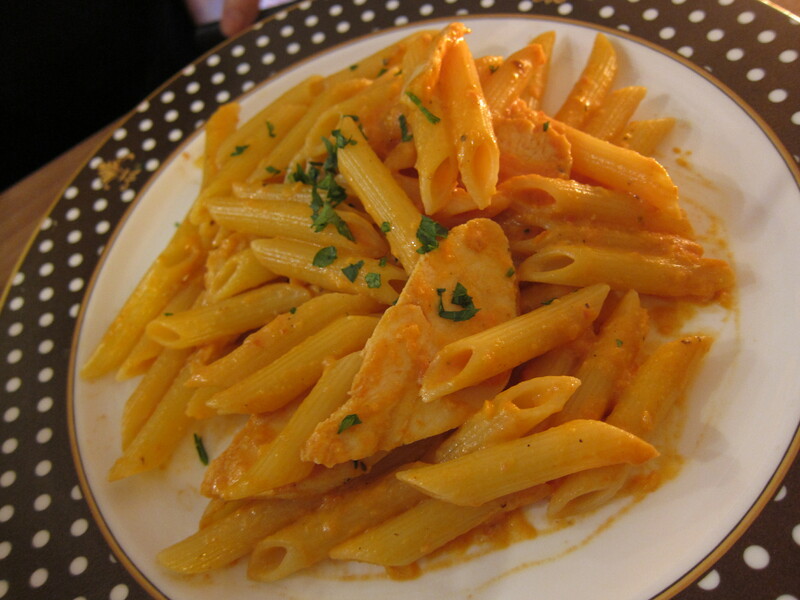 For mains, my friend had the NYC Style Penne alla Vodka with Chicken Breast. Here, the pasta (I nicked some haha), was nicely al dente and the sauce rich and creamy with a good balance of tomato and garlic flavours and a sharpish tang from the splash of vodka. We both agreed that this would have been a far more comforting dish if they had a been more sauce. As for my chosen main, I went for my ultimate pasta comfort dish Spaghetti Carbonara. 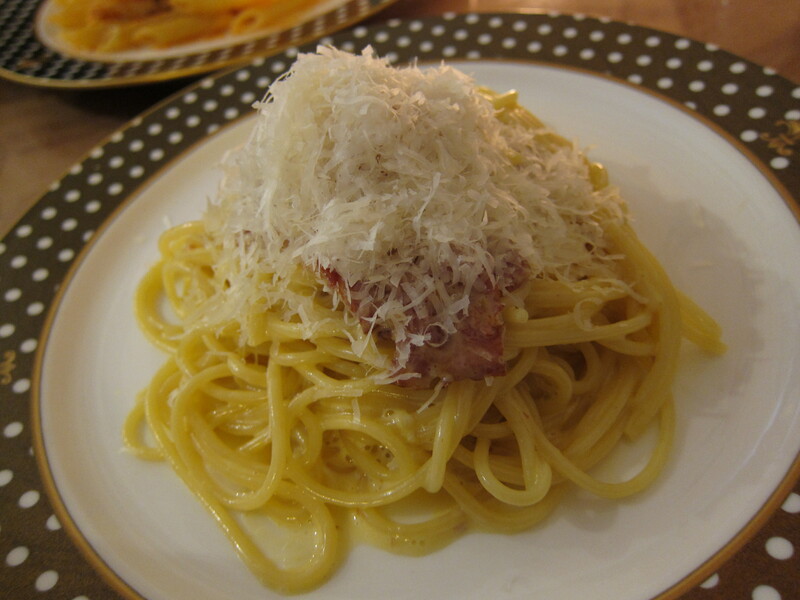 This was cream and carb satisfaction to the max with a generous topping of Parmesan cheese, just the way I like it. It was cheesy and filling and completely obliterated any feeling of hunger. The major let-down of both mains was that they came out a bit on the lukewarm side, something that I later relayed to Charlotte. 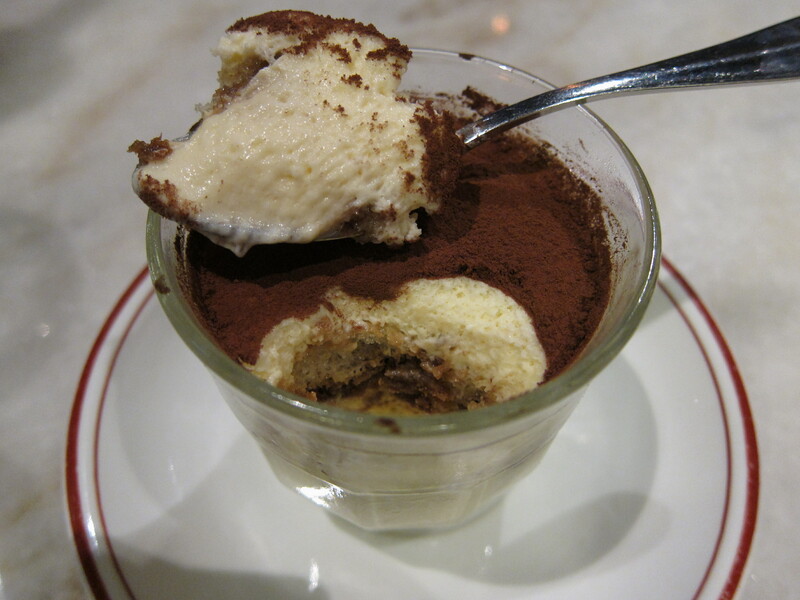 To end, we had the Tiramisu and the Chocolate Fudge Brownie with Gelato. 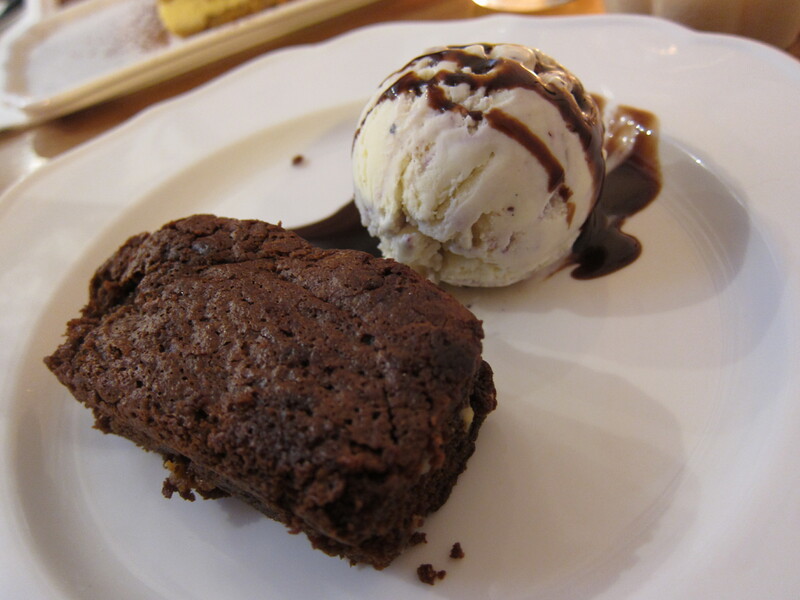 Both were solid offerings; the rich chocolate brownie sufficiently gooey/chewy and the Tiramisu flavours light and delicate. The Pasta Place is by no means out there to compete with other establishments such as Doppio Zero and I like that this mother-daughter duo are doing something they both love and gain inspiration from. 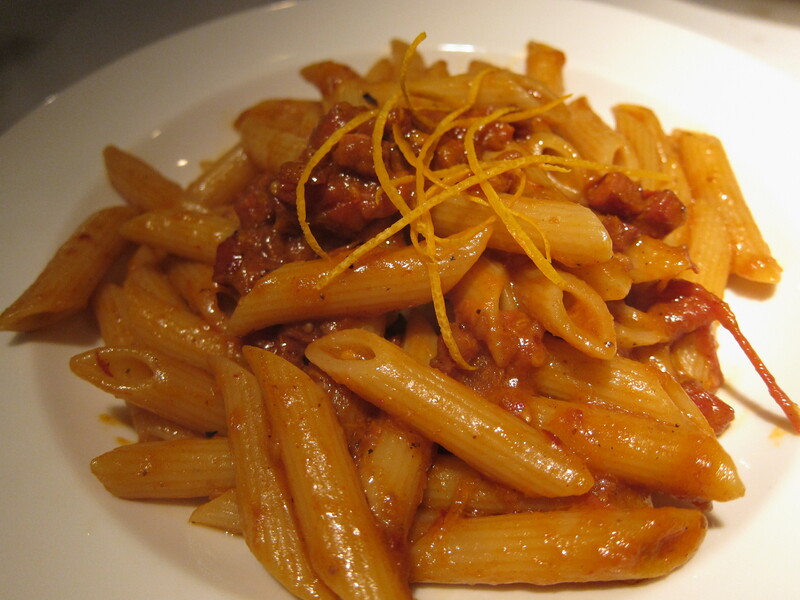 The Pasta Place will appeal to you if you crave an enjoyable, affordable meal in a restaurant with no airs or graces, just smiles and happy attitude to life. This was by kind invitation- thank you to Andrea and Charlotte at The Pasta Place for having us! 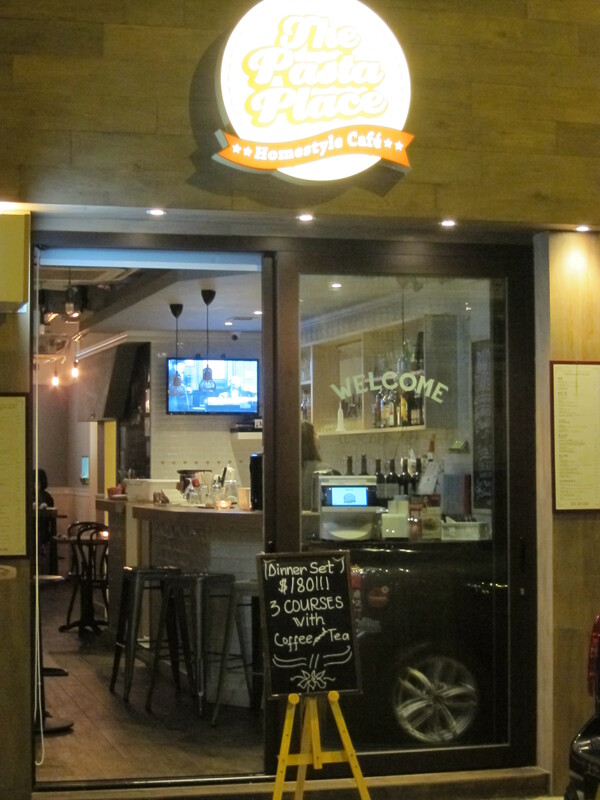 Categories: American, Italian | Tags: Hong Kong, Italian-American cuisine, mozzarella, pasta, Penne alla Vodka, Sheung wan, Spaghetti Carbonara, The Pasta Place, tiramisu | Permalink. Out of the sandwich offerings in Hong Kong, most are a bit meh sometimes, (interpret that word as you see fit 😛 ) except for Pret A Manger and possibly Oliver’s. And maybe a dirty Subway. 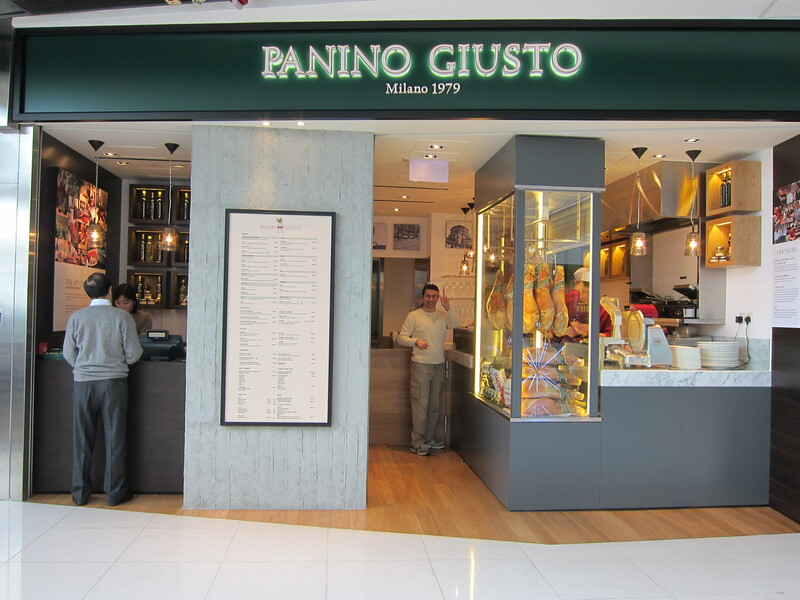 But now there is Panino Giusto in IFC Mall which specialises in Milanese ‘sandwiches’- Panini. 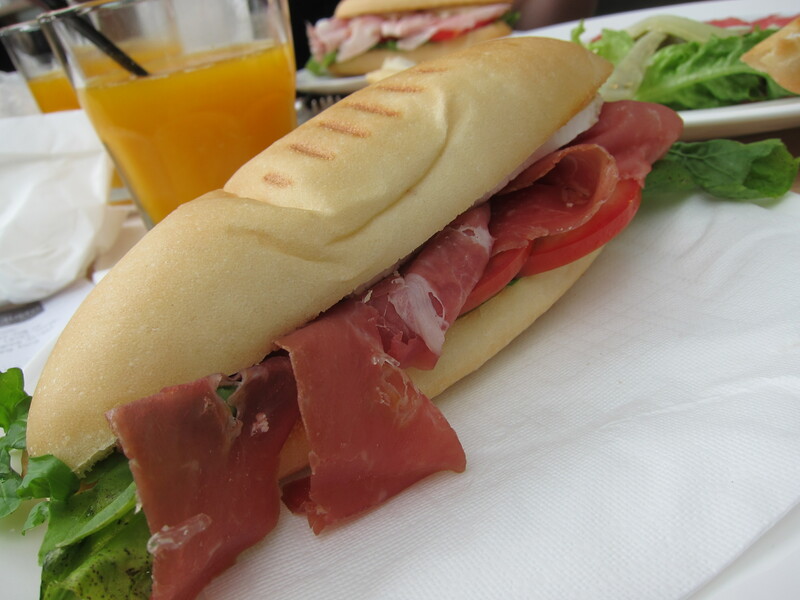 Established in 1979 in Milan before branching internationally, Panino Giusto brings us authentic, freshly-made panini, as well as toasties, plates of sliced meats, salads and desserts. You will not catch this store pre-making their panini and cling-wrapping them to go! They say the key to their success is their “rule of 7”: 70 grams of freshly sliced meat, 70 grams of cheese, vegetables, sauces and oils, sandwiched between 70 grams of French bread. 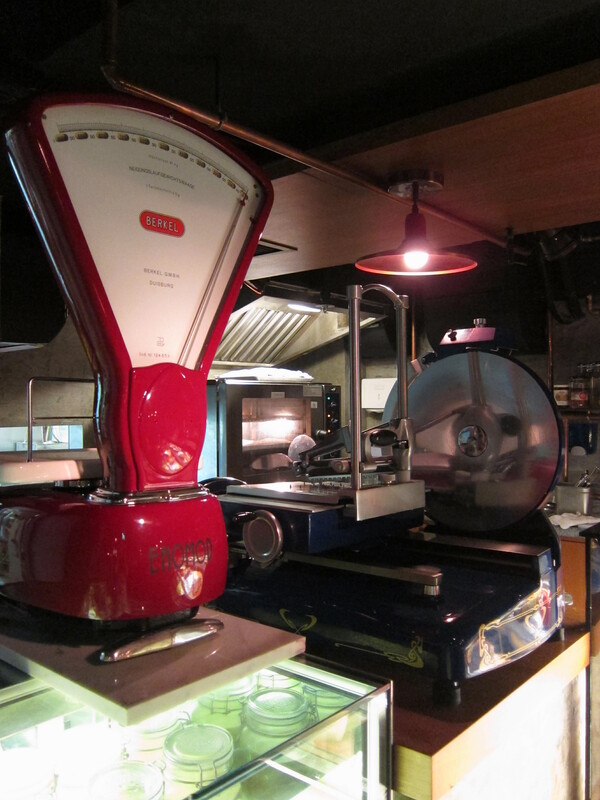 All ingredients are hand-picked from Italy and then Panino Giusto branded. Location-wise, I love it. On the 3rd Podium level of IFC Mall, it has the benefits of the roof a few steps away, sunlight pouring through the glass windows and a pleasant seating area for a relaxed meal or coffee and dessert. 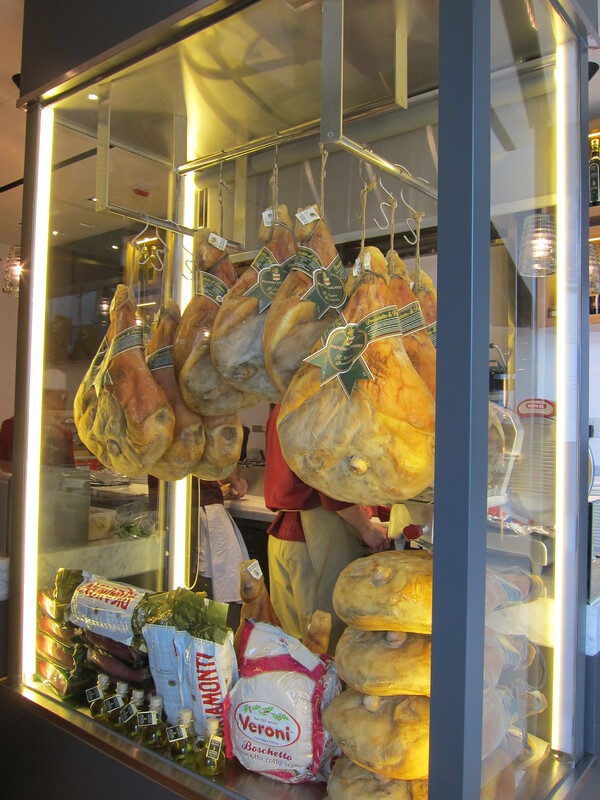 It’s great to see their fridge of hanging meats taking centre stage at the front of their store, alongside a shiny red Berkel meat slicer. 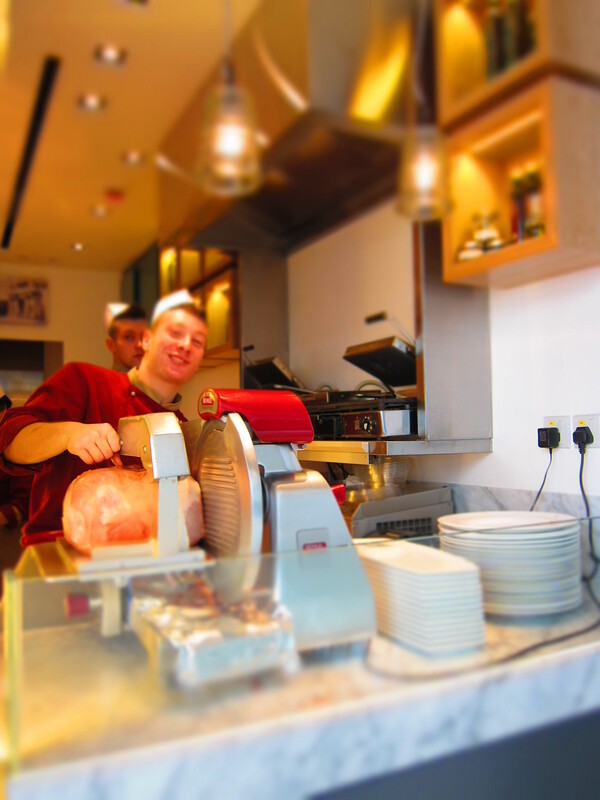 There’s something exciting about seeing big chunks of amazing hams and meats being sliced in front of you for your panini. Guaranteed freshness. My friend and I were given a voucher to try out a couple of their panini, one salad, a starter and a dessert when the shop first opened, although since then I have been back for more and I can tell you that the quality and my enjoyment has been consistent. One of their must-have panini is their signature Tartufo, a delicious panino of Parma ham (24-month aged), Brie, tomato, rocket and Alba truffle oil. 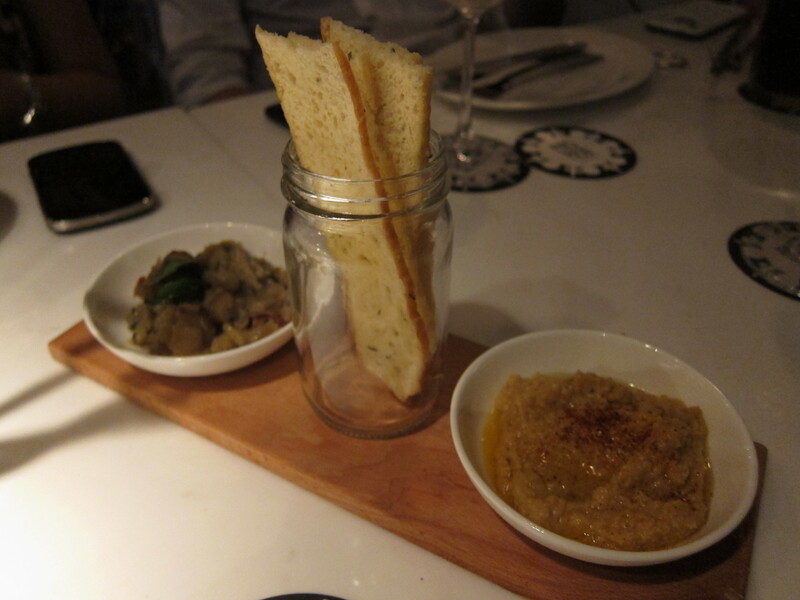 The rich scent of the truffle oil hits you when the warm panino arrives and I just loved the whole combination. I also quite enjoyed the fact that the Brie is not melted, just warmed by the toasted bread as it gave the panino added texture instead of being a warm, gooey mess. This has become my favourite at Panino Giusto whenever I go. 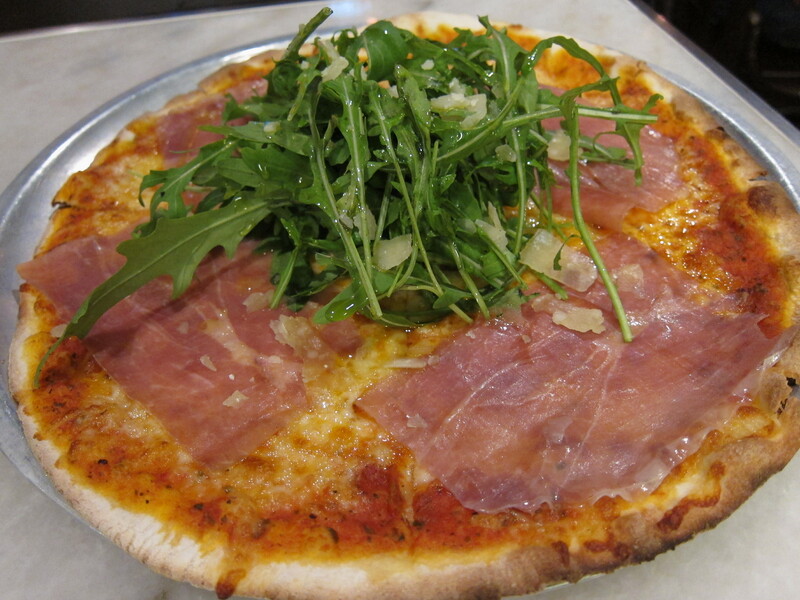 Another lovely panino is the Savoy with Praga ham, Mozzarella, tomato, rocket and a drizzle of extra-virgin olive oil. 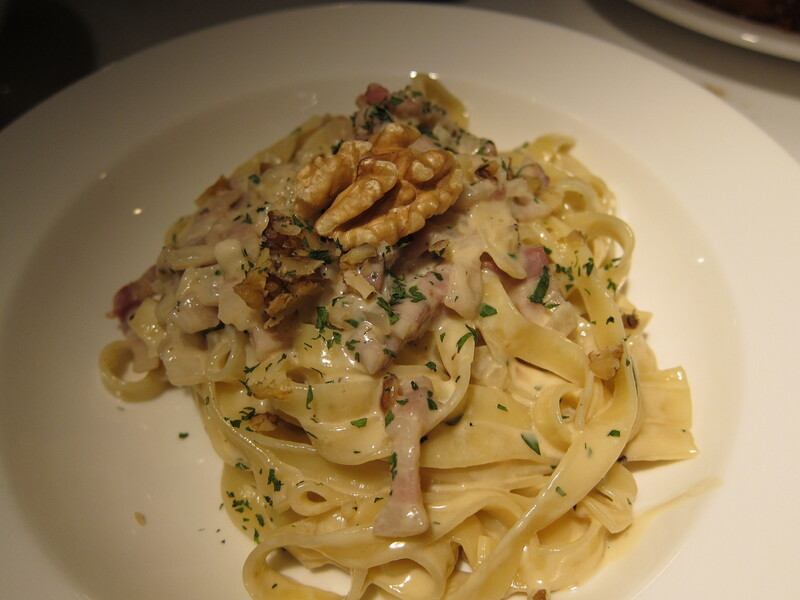 All the flavours were quite mild but nevertheless, it makes for a lighter and less salty offering than the Tartufo. 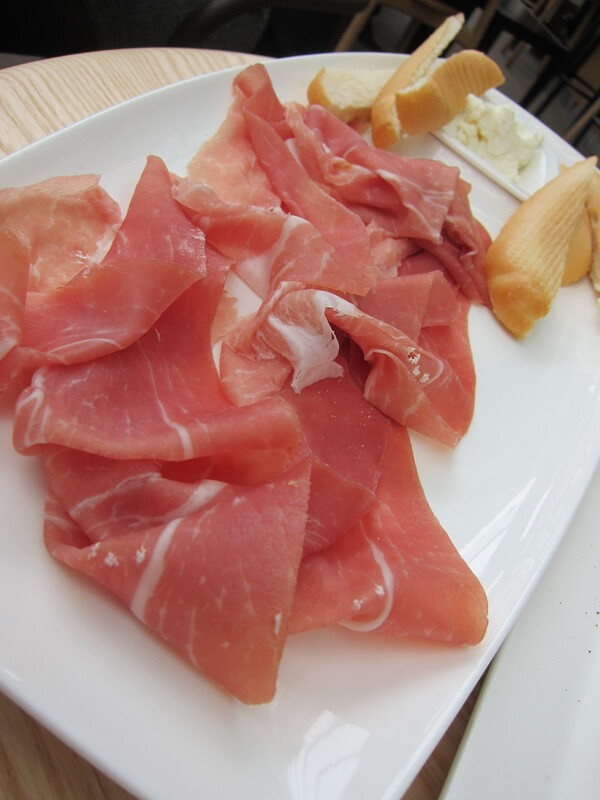 We also tried their Stuzzico Crudo E Caprino starter dish of Parma ham, goat cheese and warm bread. 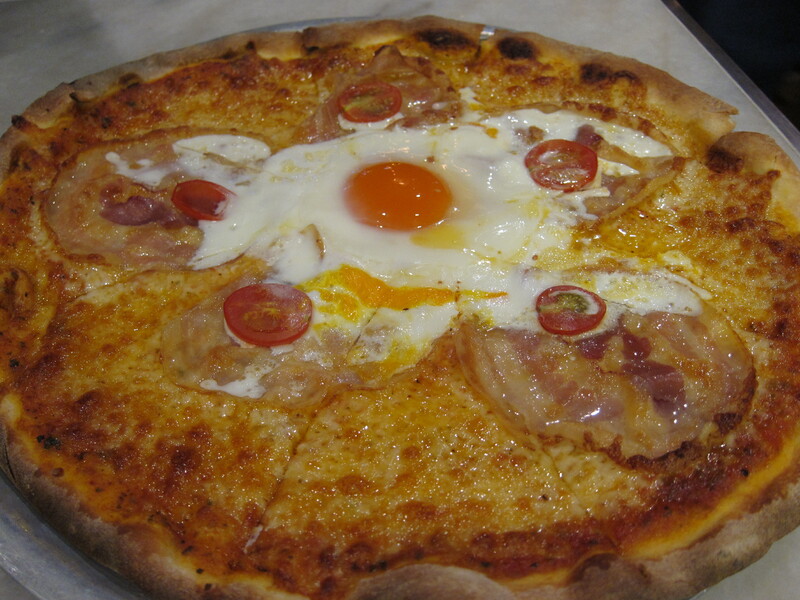 I admit, we ignored the bread and the cheese in favour of stuffing ourselves with the moreish slices of Parma ham. At $88 for a plate, I have to say that it is worth it seeing as going to the deli counter at Taste or CitySuper for Parma is outrageously expensive for possibly around the same number of slices. 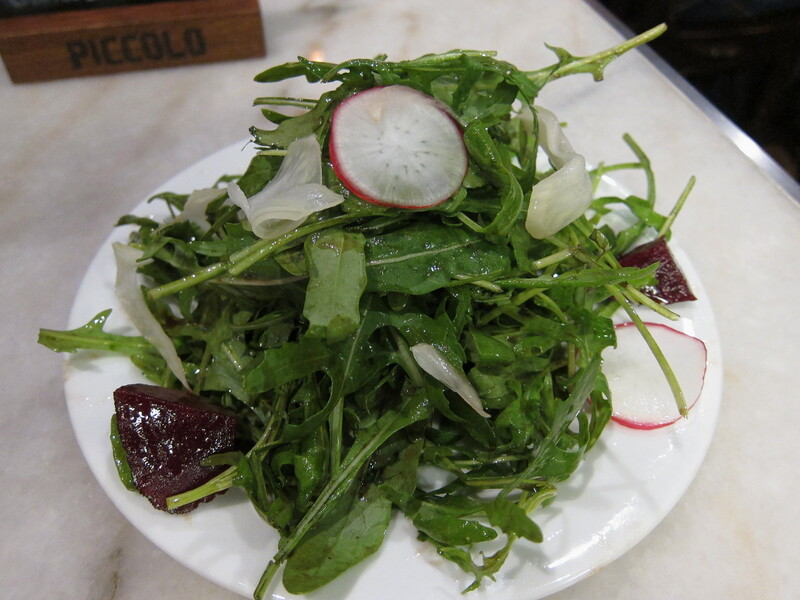 Their Pratomagno salad of Carpaccio, herbed artichokes and fresh Parmesan was also lovely. 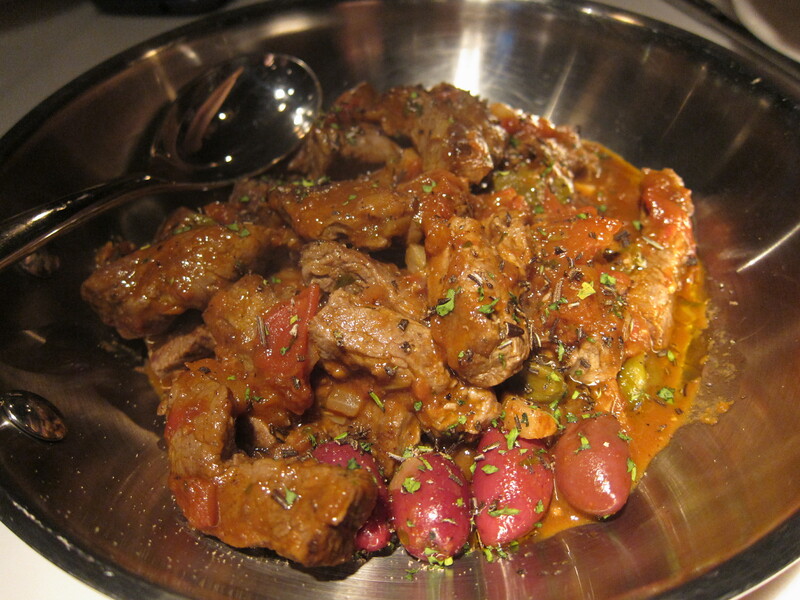 The beef was delicate yet full of ‘beef’ flavour and went well with the artichokes. 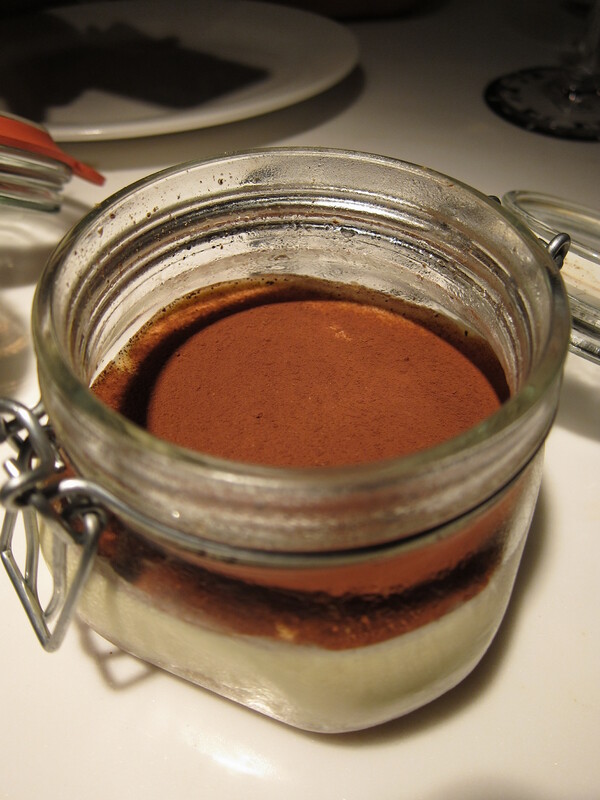 To end we had their house-made Tiramisu. Those of you who enjoy a heavier coffee taste may be disappointed with this but though creamier than other versions, I thought it was rather scrumptious and not overly laced with rum. Although most of the panini may be a little steep at $78 -88 each depending on ingredients, Panino Giusto is, I think, the place to go for a panini fix. There is a fine and quite large selection to choose from and you needn’t worry about not feeling satiated afterwards; they are filling enough to keep you going for the rest of the afternoon. 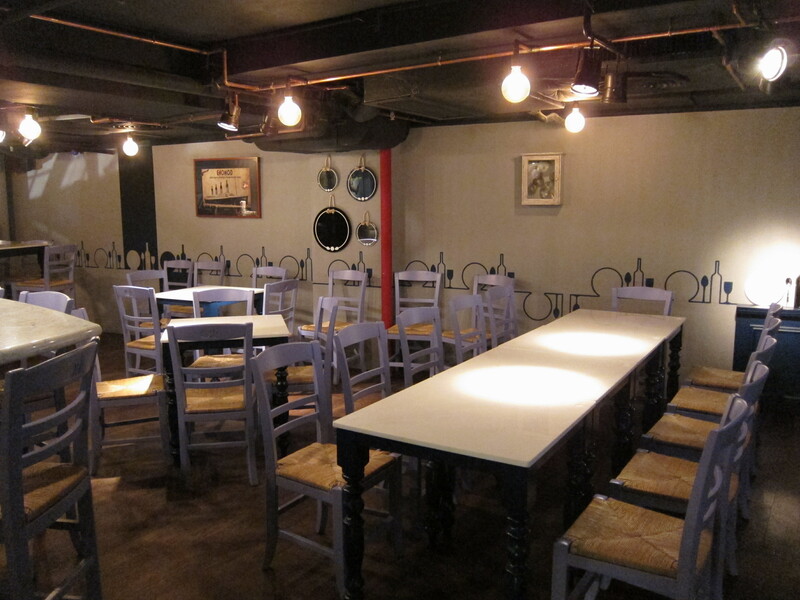 The salads and starters are good but definitely not the main attraction. 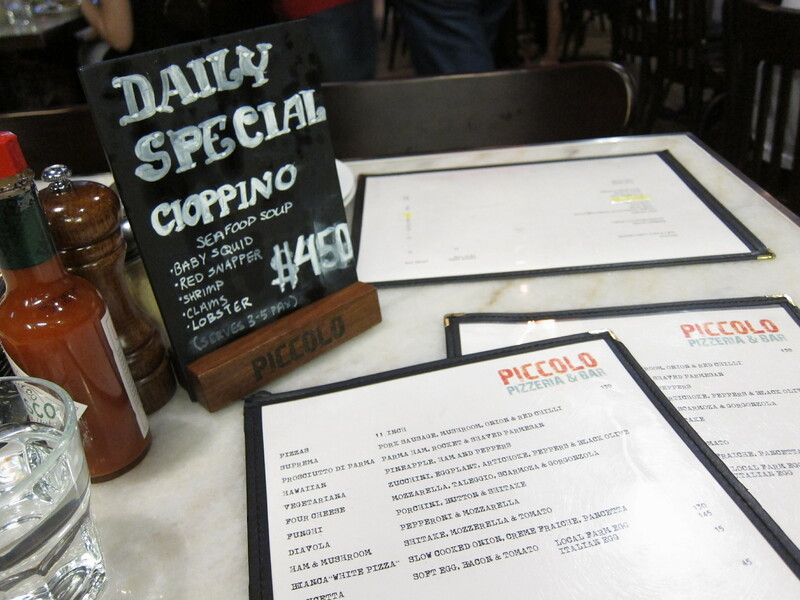 Categories: Italian, Lunch, Sandwiches | Tags: Brie, cold cut meats, IFC Hong Kong, IFC Mall, Italian cuisine, lunch, Milan, Milanese sandwich, mozzarella, Panini, Panino Giusto, parma ham, Prosciutto, sandwiches, tiramisu | Permalink. The views are truly spectacular, if somewhat dizzying, the interior spick-and-span, sleek and luxurious, the feel and atmosphere buzzed with a touch of new and unseasoned. What is this place I speak of? None other than The Ritz-Carlton at ICC. It’s taken me almost a year to get myself over there, but I finally made it. It’s swish inside, as to be expected, the staff obliging and smiley, and as I rode the lift and nervously glanced at the escalating floor levels and getting slightly paranoid about any movement I felt, I couldn’t help but marvel a little at the sheer scale of this hotel. Boasting the highest bar in the world (Ozone, on the 118/F), is no mean feat and even if you have no intention of staying or dining there, I’d say it’s worth a fly-by visit. 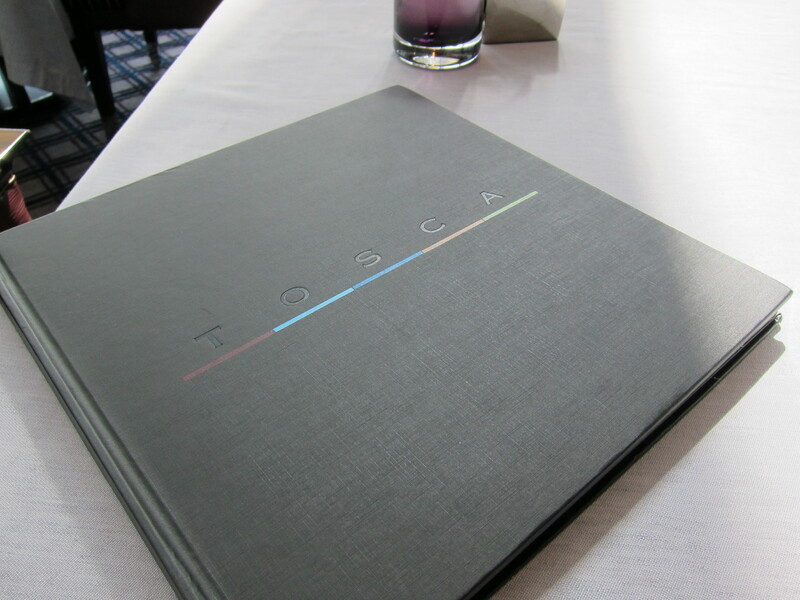 The day I went, I was off to have lunch at their Southern-Italian restaurant, Tosca, on the 102nd floor. 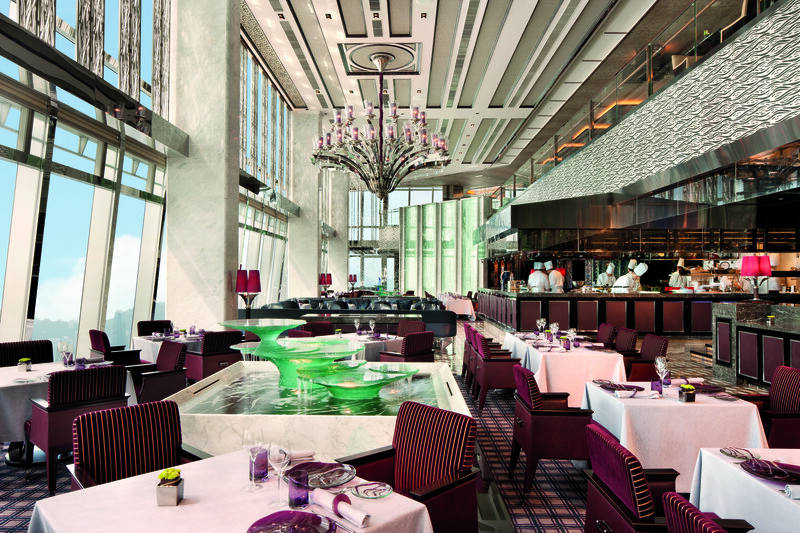 The impact of the decor is quite dramatic, with high ceilings, water fountains (to reflect the water theme of the restaurant), chandeliers and velvet seating. 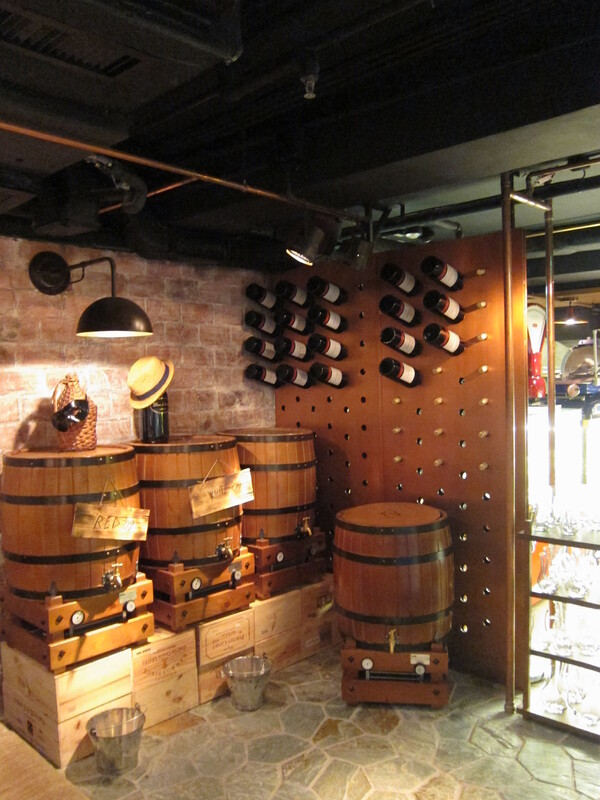 A nice touch is the open kitchen, something that seems to be de rigueur in Hong Kong. 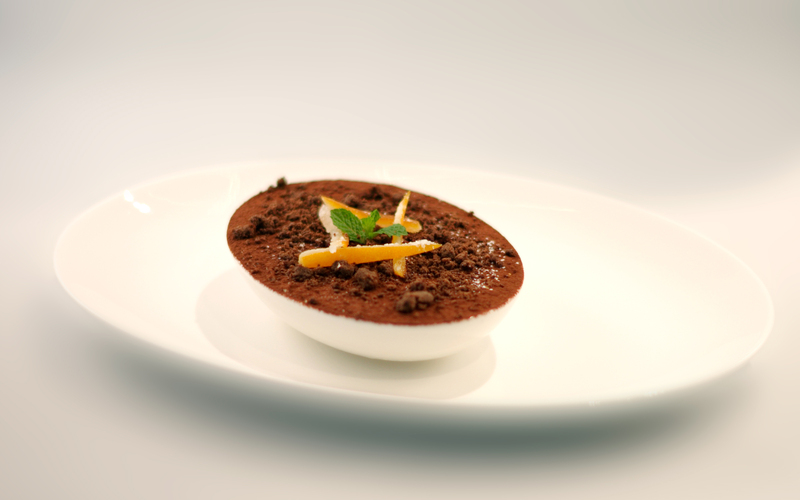 Neopolitan Chef Vittorio Lucariello, has brought a classical menu with traditional Italian ingredients, to Tosca and has ensured that 90% of the ingredients are sourced from Italy, down to the flour. 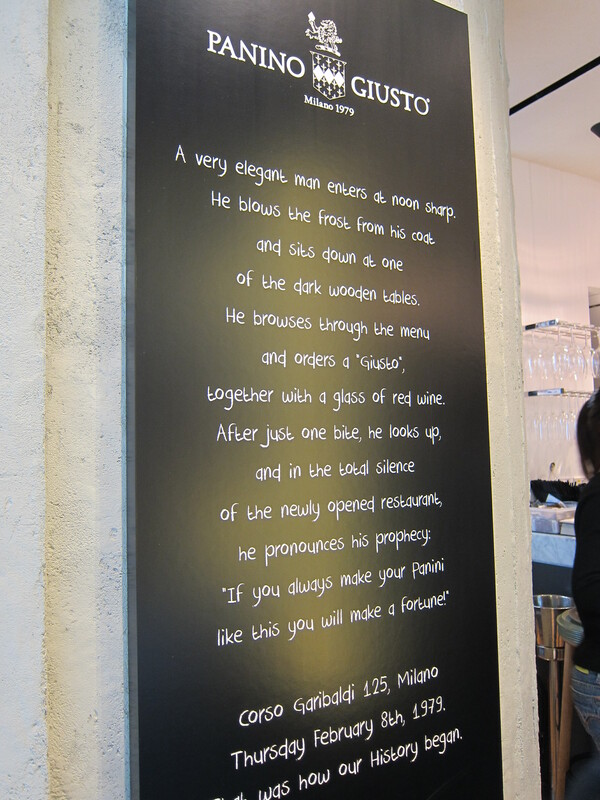 We had an epic lunch to look forward to, as it was recommended that we try all of Chef Vittorio’s Signature dishes, plus an additional antipasti of Fassone beef carpaccio, asparagus, anchovies and extra virgin olive oil gelato. Both Chef Vittorio and The Ritz-Carlton’s Executive Chef Peter Find, were kind enough to swing by our table and enthusiastically explain the dishes, which were all quite complex with their ingredients. Post dish break-down my palate had a chance to sort out the myriad of flavours offered in some of them! To start we had a lovely looking amuse bouche of mozzarella, sun-dried tomato and anchovies and Chef Vittorio presented us with a single rigatoni with a delicious pork, tuna, and chilli sauce, which had a very distinct Southern Italian taste. 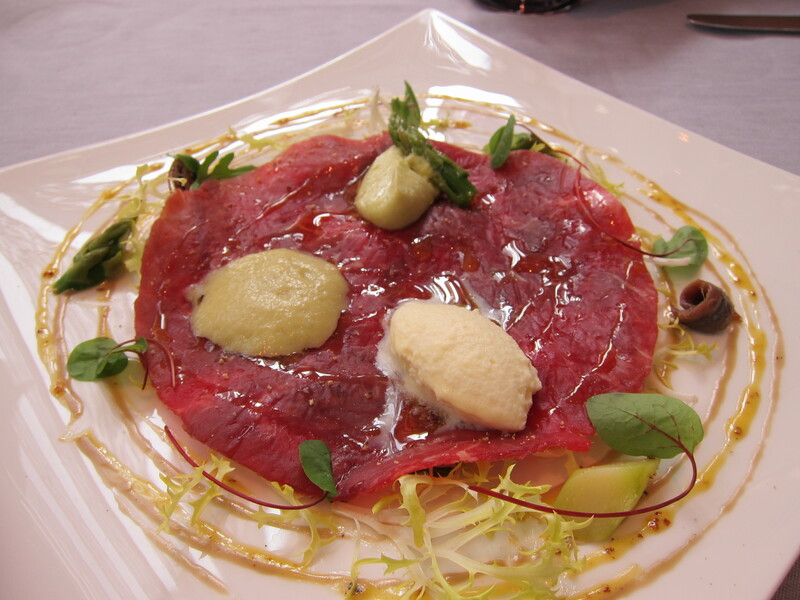 The beef carpaccio, with olive oil gelato, asparagus foam, asparagus puree, anchovy sauce and honey mustard dressing was aesthetically interesting, but difficult in practicality to dish out. 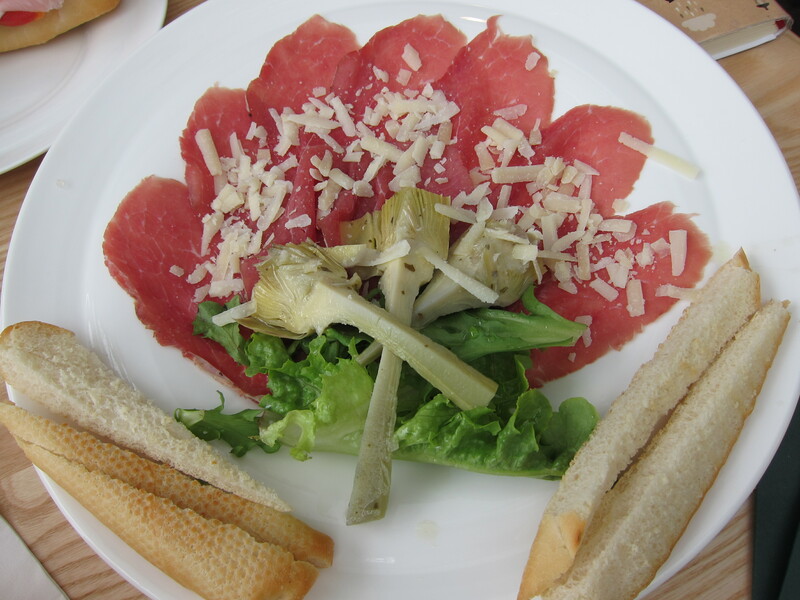 The carpaccio looked like a thin, flying saucer of beef, with toppings. 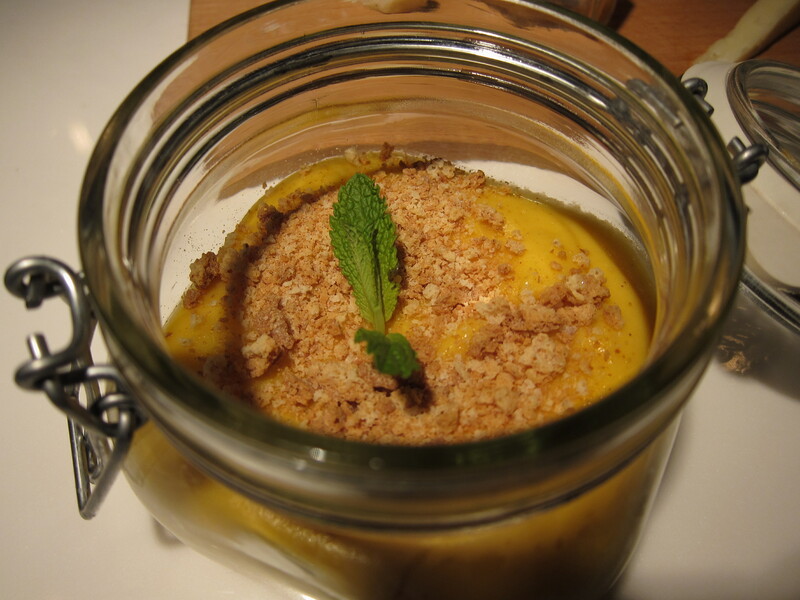 The intriguing parts were the accompanying gelato, foam and puree. The olive oil gelato was sweet, palate cleansing. 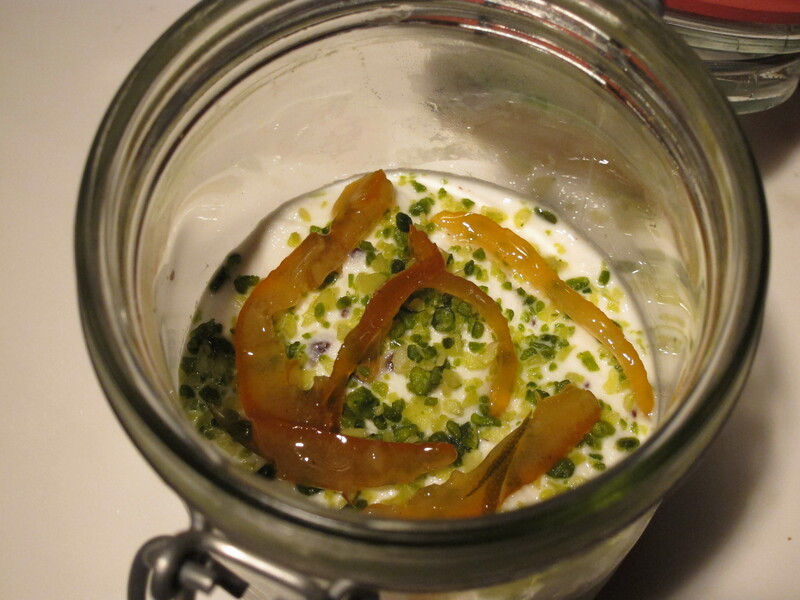 But I found the sweetness intensified at the end and didn’t have a strong enough ‘olive oil’ taste. My favourite was the asparagus puree but the foam’s taste was too delicate and indistinct and was quickly overwhelmed by the gelato. 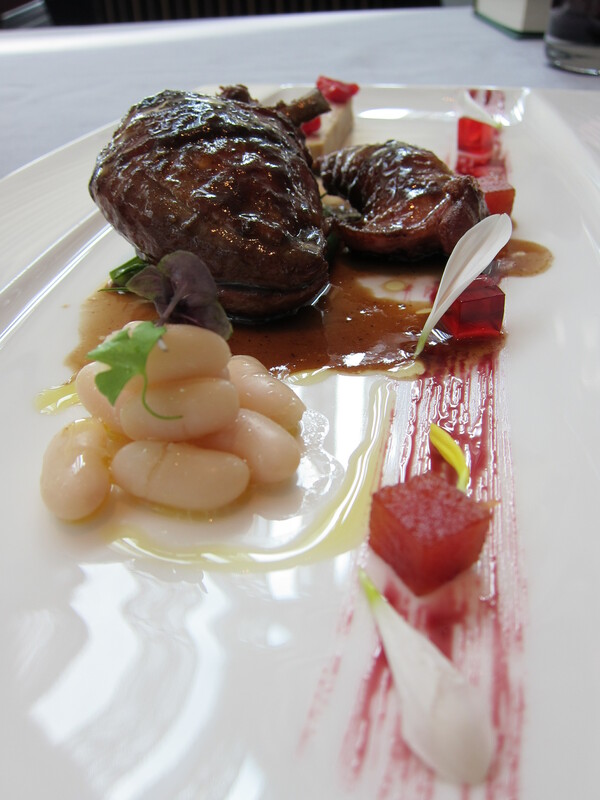 The roasted pigeon was succulent, and the foie gras so intensely rich, that it was a little too much for me, (shocking I know), but the Campari jelly helped to cut through the heaviness. 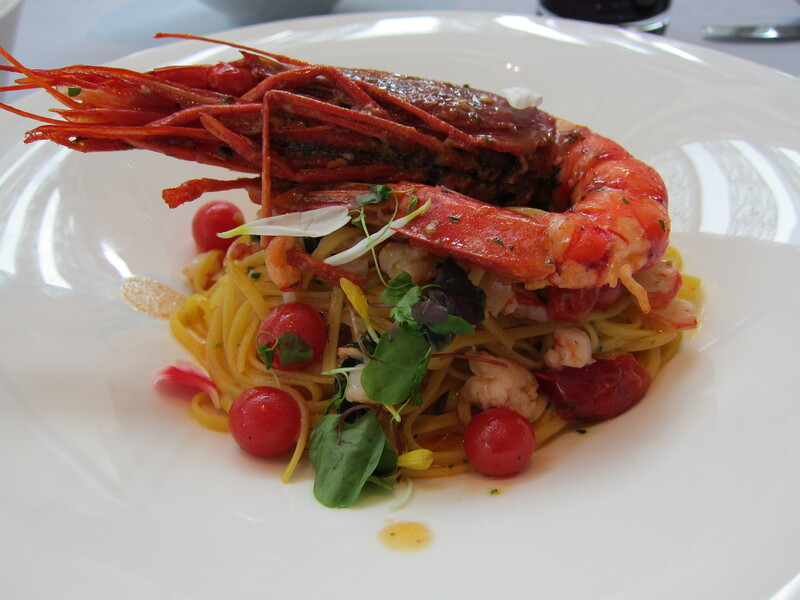 The Tagliolini with red prawns had a wonderful texture, the prawns perfectly. They were a bit liberal with the salt but the little tomatoes in the tartare were wonderfully warm and sweet, giving a lovely balance. Was this the end of the meal? Absolutely not. 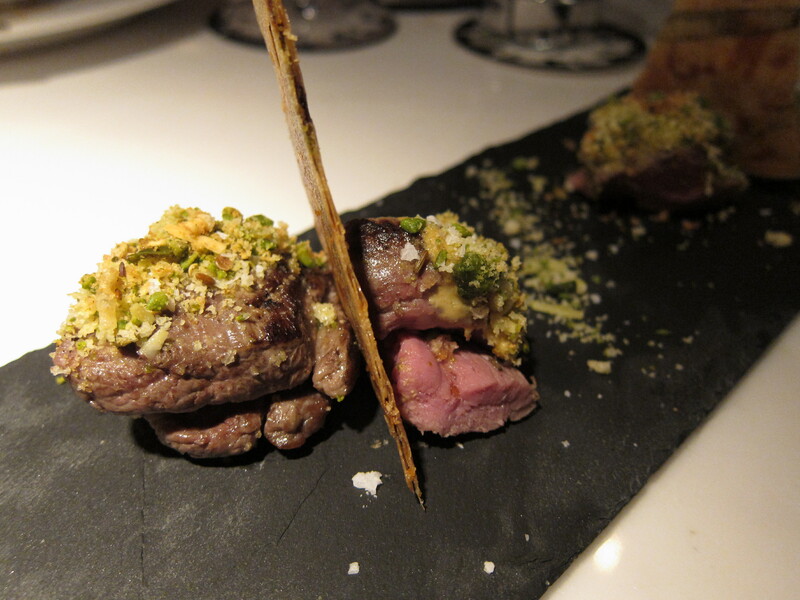 We charged on and welcomed the tender lamb chops with an excellent, crunchy pistachio crust and a Jerusalem artichoke mash. I felt that this dish almost seemed to cater more for Asian tastes, as the accompanying French beans had a Cantonese flavour to them. 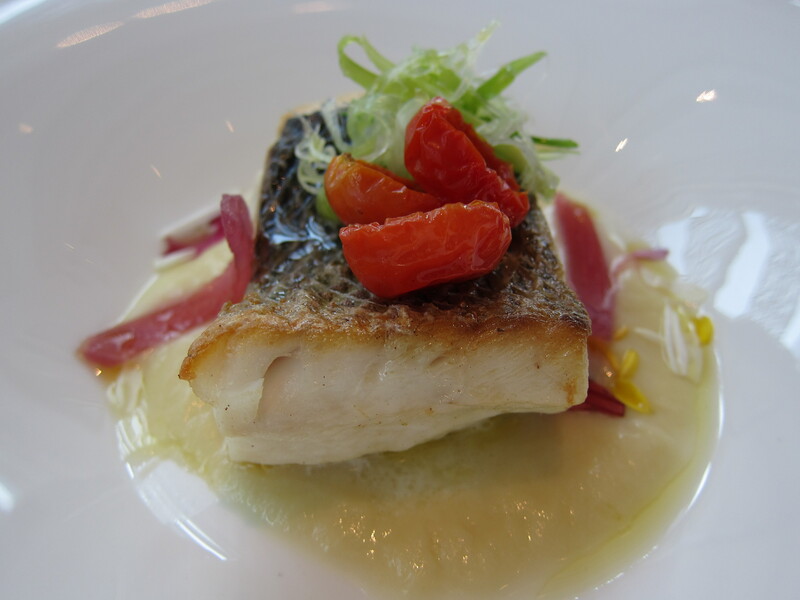 Our last main dish was the Mediterranean Sea bass. The top half of the sea bass was fantastic, but the bottom half was a tad overcooked. 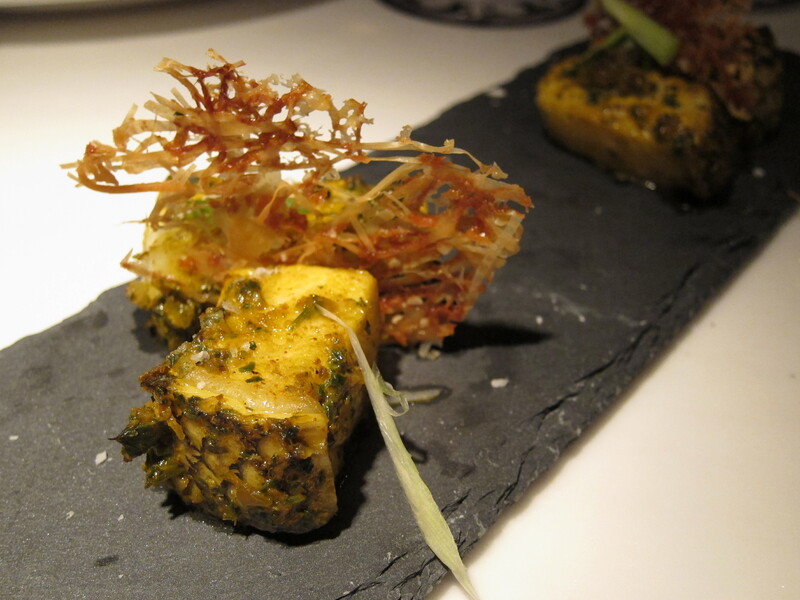 The spring onion fondant was overwhelming, masking the gentle taste and texture of the fish, which was a shame. I wasn’t sure of the intention with the spring onion but I do think it is overpowering for this dish. 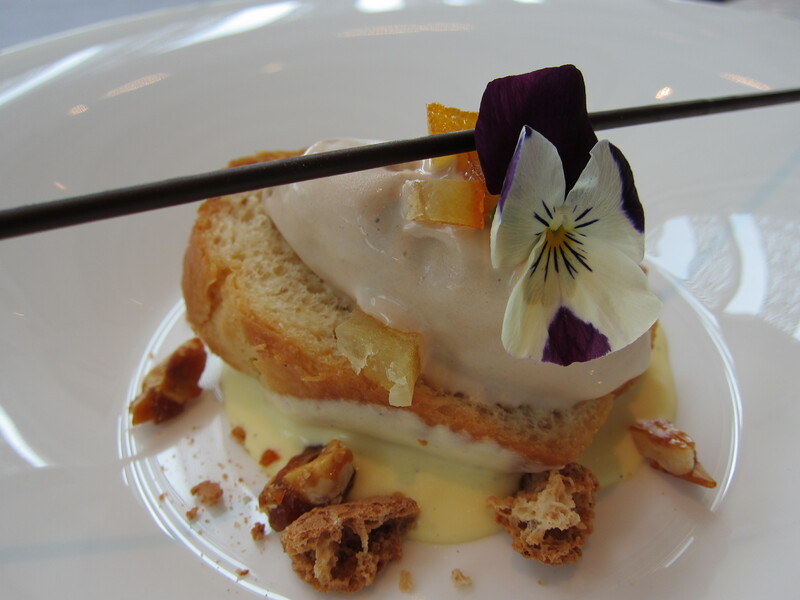 Luckily there is a separate stomach for dessert (wishful thinking), as we had the Baba’ (citrus sponge cake), with cherry custard, pine nuts praline and malaga gelato. The rum raisin ice-cream was scrumptious and the sponge full with tangy syrup. 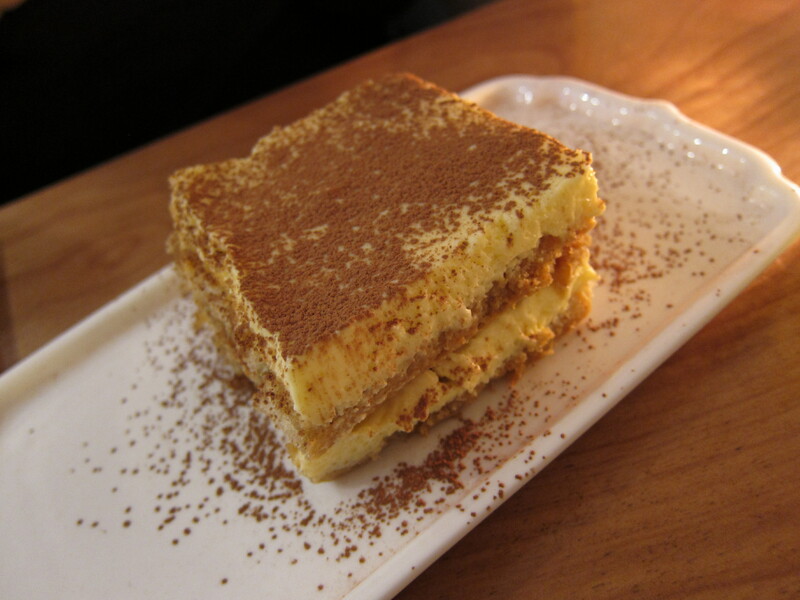 The signature dessert is the Tiramisu, made with illy coffee, Italian eggs, (giving it a more yellow colour) and homemade crumbled cookies. It was not too bitter and all sorts of chocolatey goodness which paired well and penetrated the creaminess. In short, it was incredibly indulgent as a dessert, as it should be. 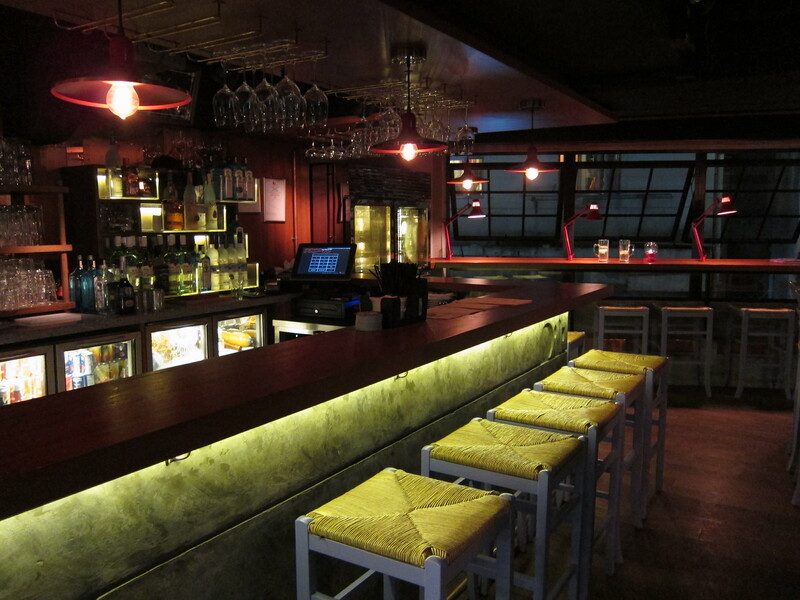 You can also read this review on Sassy HK. 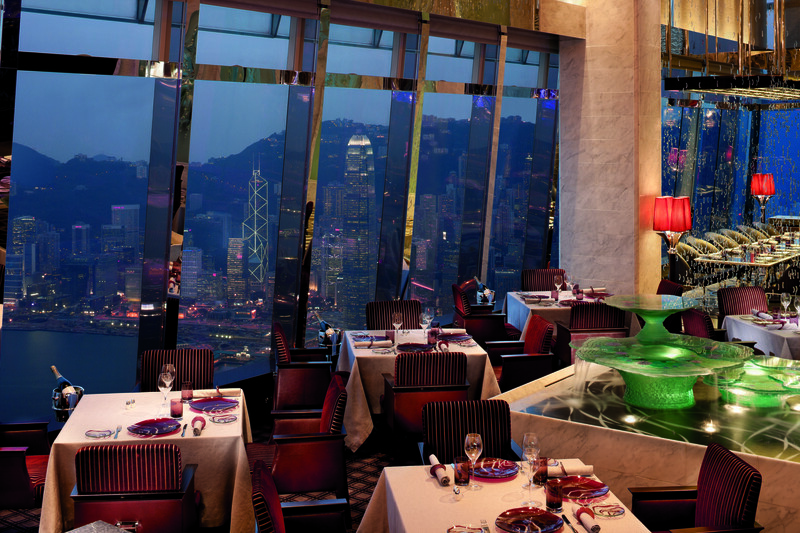 Categories: Italian | Tags: Hong Kong, International Commerce Centre, Kowloon, Ritz-Carlton, tiramisu, Tosca | Permalink. Wyndham Street isn’t the longest road in Hong Kong, but it sure has a ridiculous number of restaurants and bars along it. Rest assured, you’d never starve or go thirsty. I’ve been meaning to get myself over to W52 for yonks, (the interior always looks very inviting when one is queuing outside of Tazmania Ballroom on a Saturday night), but eating my way through all these places takes a while! 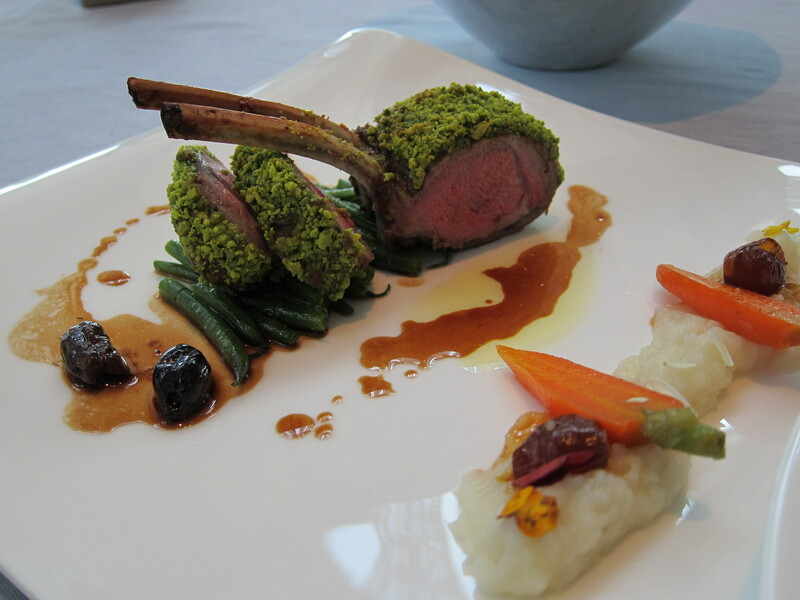 Sassy first visited W52 a few months ago, so I was excited when I was invited to sample their new Spring a-la carte menu one lunchtime. 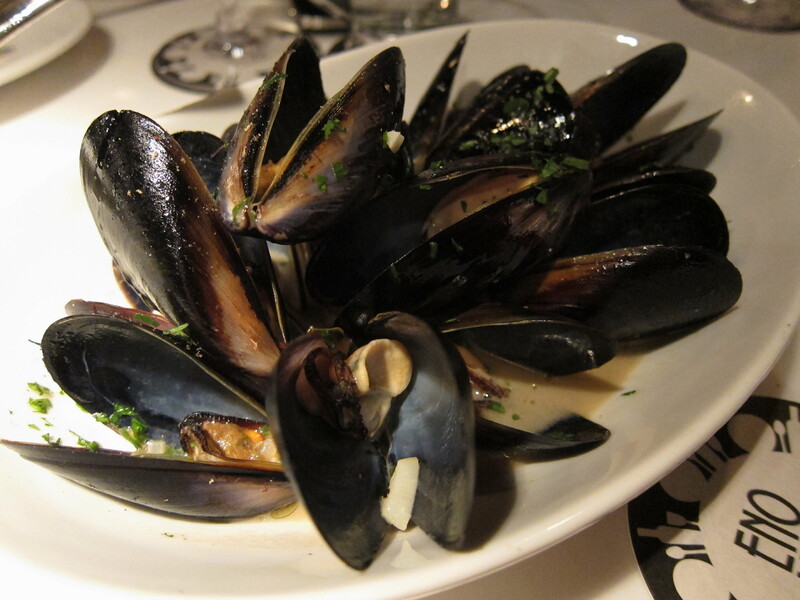 As you all know, I adore Italian food, and I’m constantly struck by the plethora of ways Italian food is created and presented and this menu certainly offers some refreshing new dishes. Unfortunately, Executive Chef Francesco Berardinelli was away so I wasn’t able to have a chat with him, but his PR lady, (with whom I dined), did leave me with a quote of his that gave me an insight into his creations: “..you can see all the ingredients on the dish, see the taste and the flavours”, (or words to that effect!). 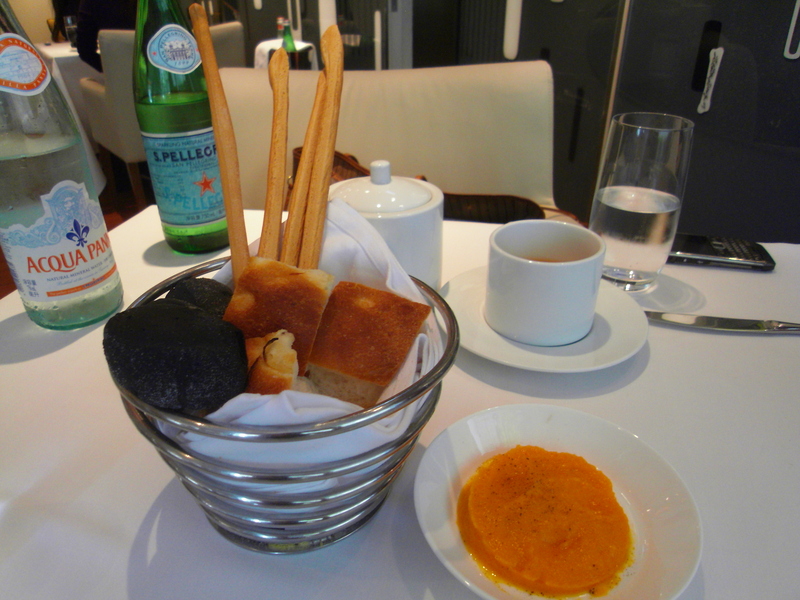 As I settled into my seat, we were given the customary bread basket which included the squid ink bread- lovely and warm with a subtle squid flavour, it was a great way to whet the appetite. 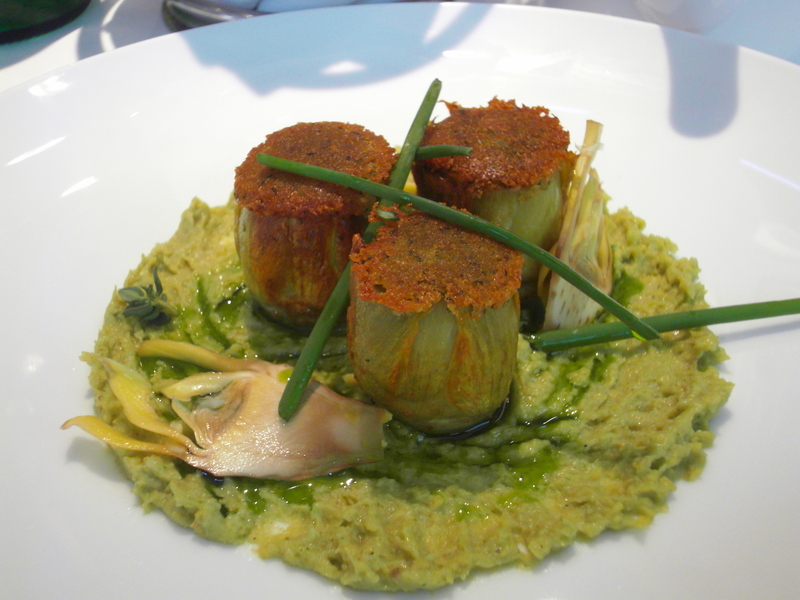 For starters, we had the Carciofi- crispy stuffed artichoke hearts with Pecorino Romano cheese and fresh herbs. 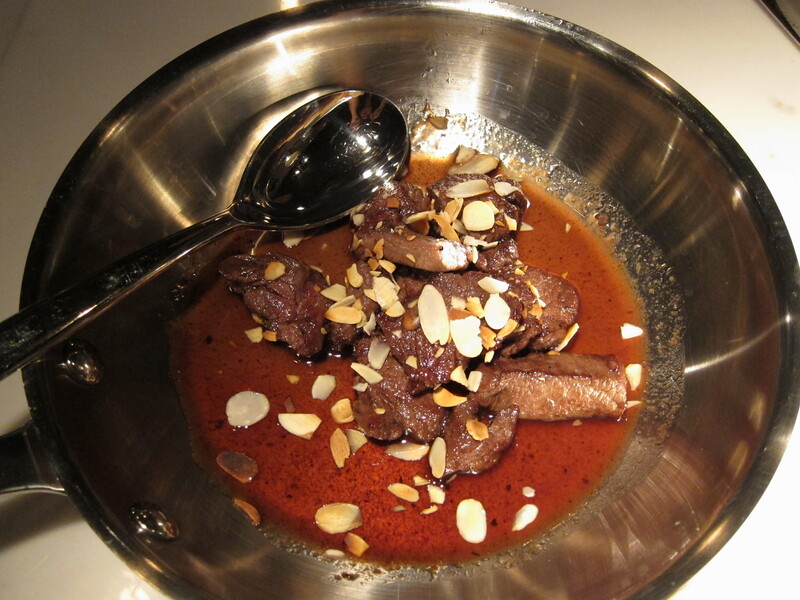 Although not a new dish, I was told that I absolutely had to try it, and I’m very glad it was ordered as it was gorgeous. A relatively simple dish, it was packed with flavour, with the refreshing taste of the artichokes bursting through the crunchy cheese topping- a winner. The next two antipasti dishes were the Melanzane- eggplant slices wrapped around buffalo ricotta cheese nestled on fresh pea puree and Polpo- bruschetta with grilled octopus, potatoes and Sardinian Mullet Bottarga roe. 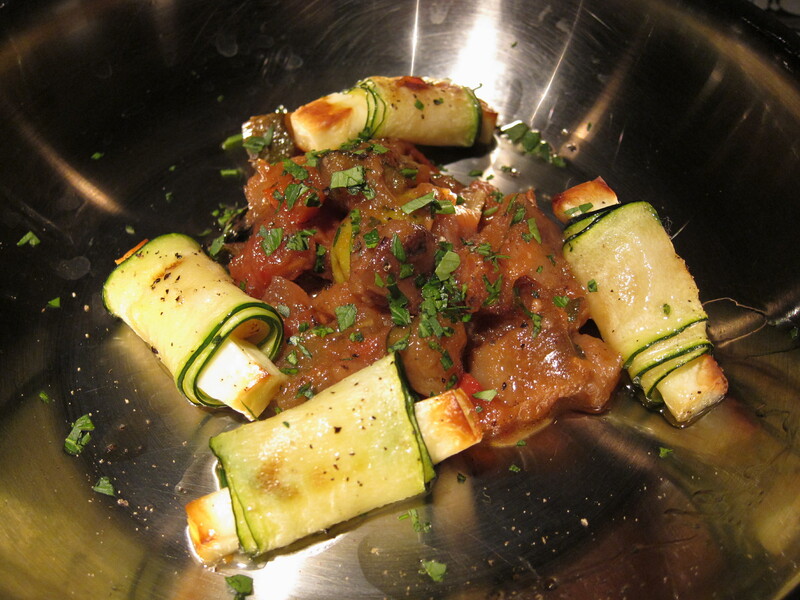 The Melanzane was delicious and quite addictive, shame there were only three on the plate! 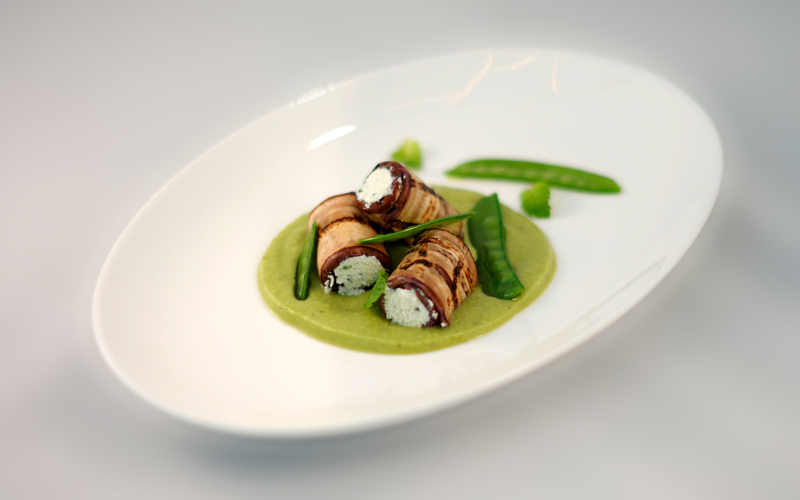 What I loved about it was the vibrant colour of the green pea puree and the preservation of the veggie taste, same with the artichoke hearts. 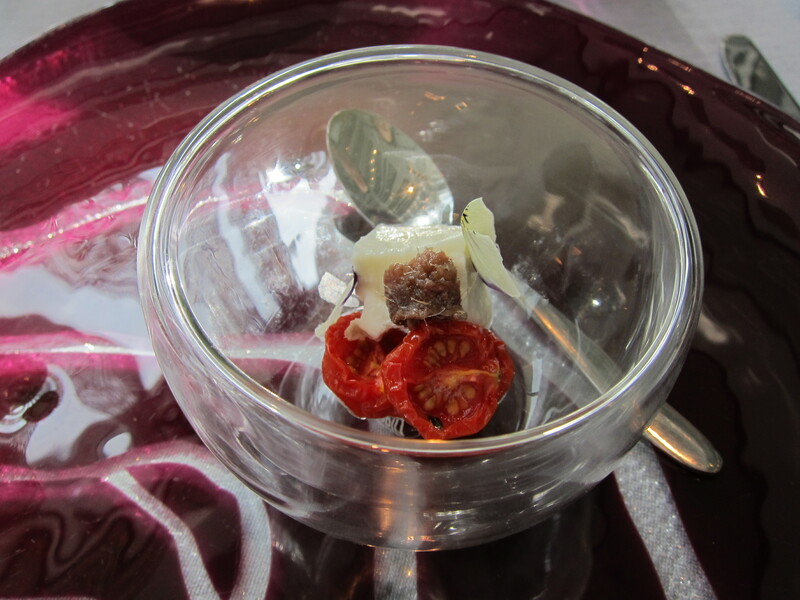 The seasoning throughout all the dishes was very light so that none of the flavours were obscured. The Polpo was also superb. 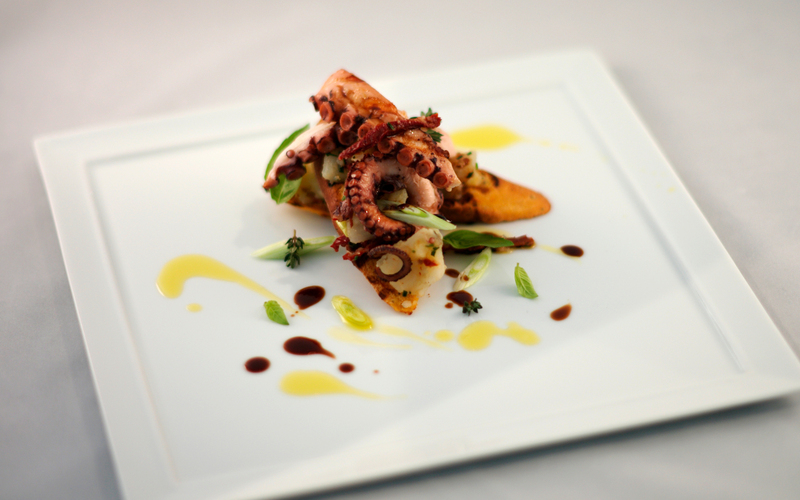 The octopus was grilled excellently, crispy on the outside and the right kind of chewy on the inside. I couldn’t wait for the main course. 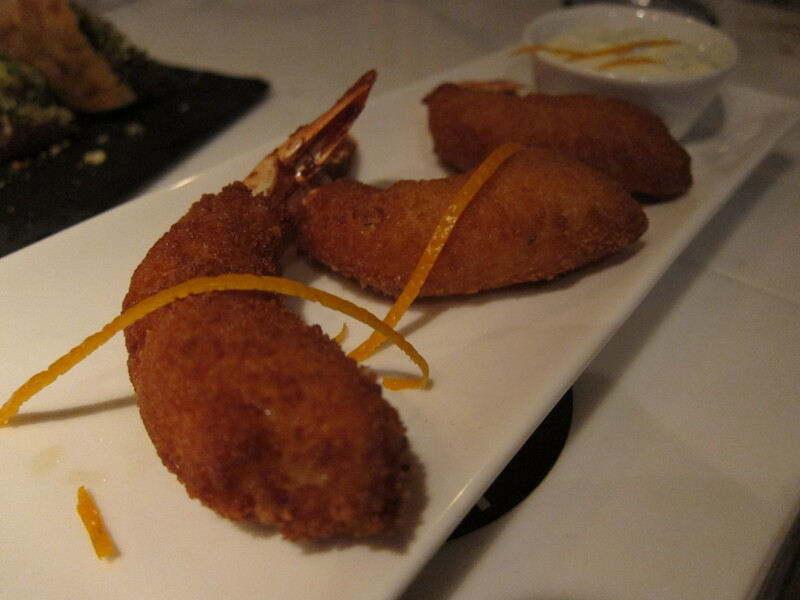 My dining companion had ordered Gnocchi di Patate – fresh potato gnocchi with a Mascarpone and vanilla sauce and toasted hazelnuts to share, and the Astice al Burro- Boston lobster with endives and an artichoke butter sauce. I was quite curious about the gnocchi. I personally think gnocchi is quite a difficult dish to get right, and on so many occasions, I start eating it and then I’m full within 5 minutes as it’s so stodgy and completely smothered in a sauce too rich to balance out the carb-tasticness of the gnocchi. 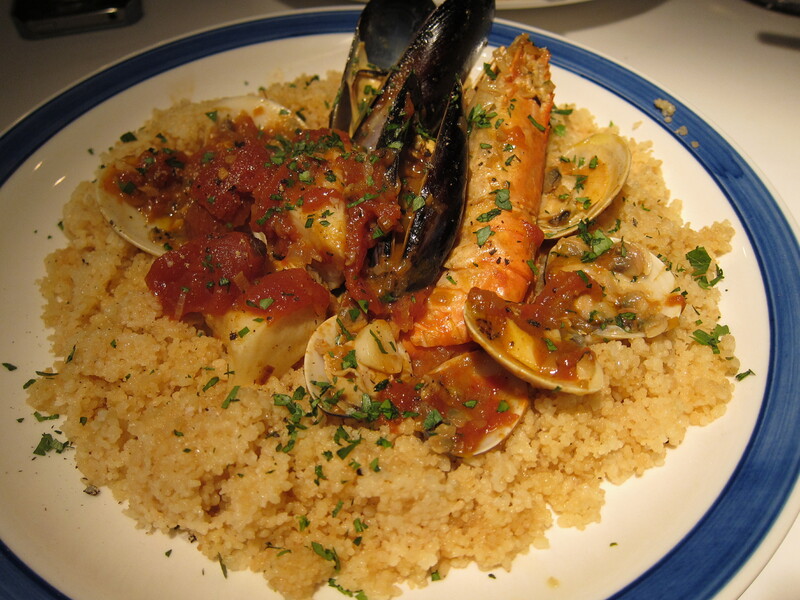 So, for this particular dish, I was intrigued indeed. Vanilla sauce on pasta seemed to be a bold move but was it a good one? Yes it was. 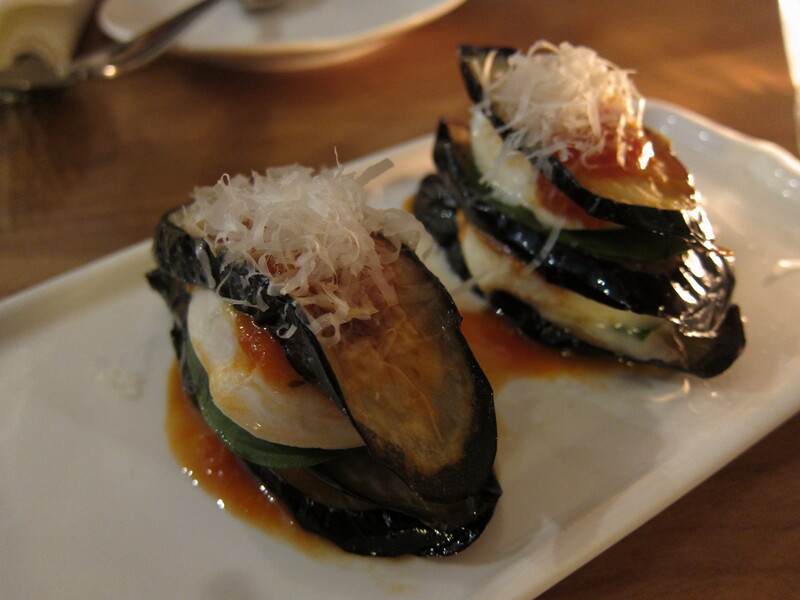 I was blown away by the dish, and to be completely honest, I wished I had a whole plate to myself. The gnocchi was surprisingly light, the sauce wasn’t as rich as I anticipated and the vanilla cut through cleanly to compliment the dish. 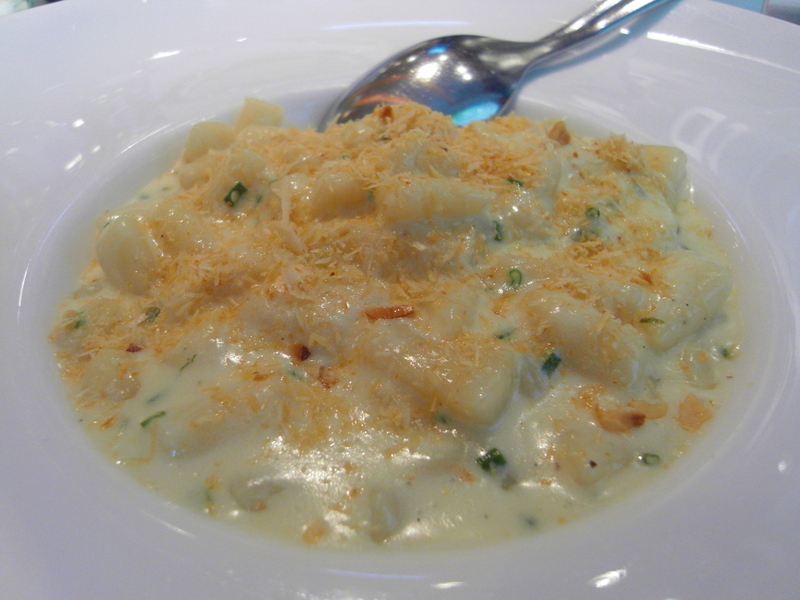 I thought the toasted hazelnuts were a great touch and somehow that added to the deliciousness of the gnocchi. Heavenly! The Boston lobster was immense. We thought we were sharing one, but they ended up giving us one each! Not that I was complaining, but I was starting to get pretty stuffed at this point, so this was my Mount Everest to climb. 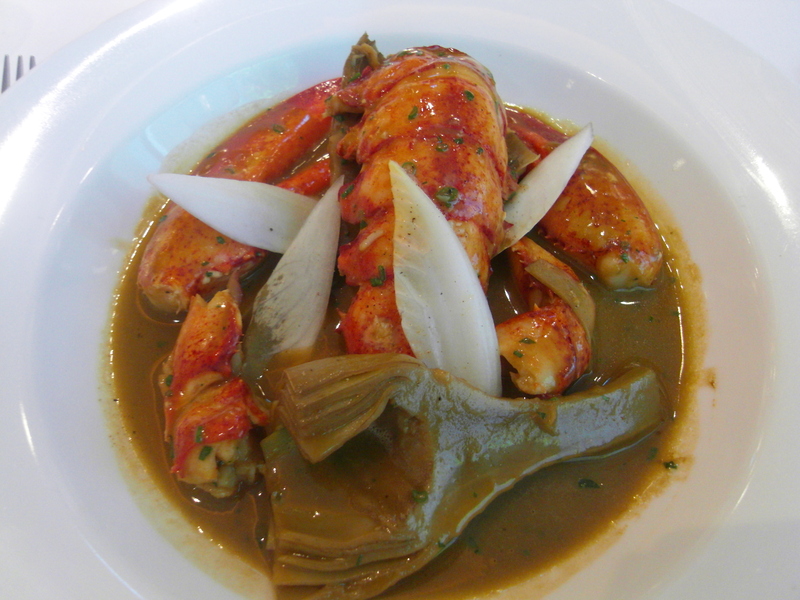 An elegant, yet humble looking dish, with muted colours, (don’t be put off by the murky green artichoke butter sauce) the lobster was cooked to perfection and had a wonderful meaty chewy texture. 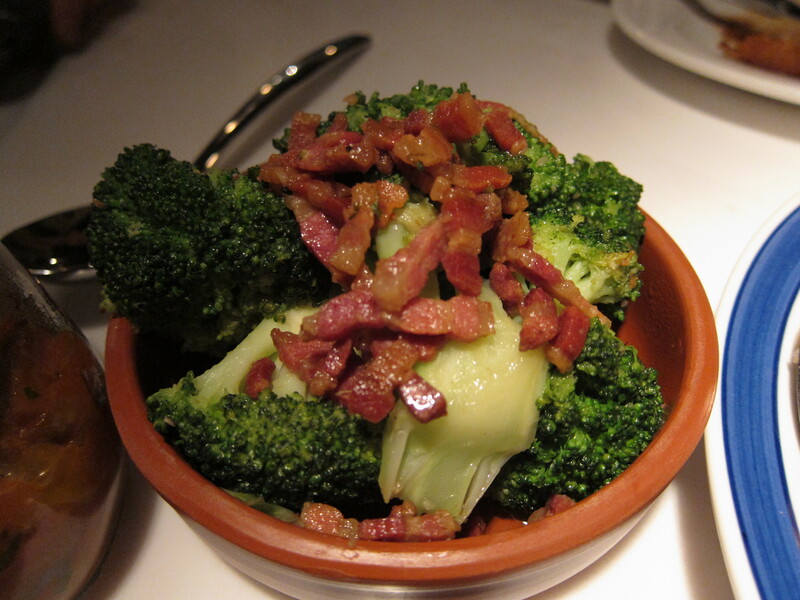 The endives were a great and simple compliment to the lobster which needed no extra side dishes. 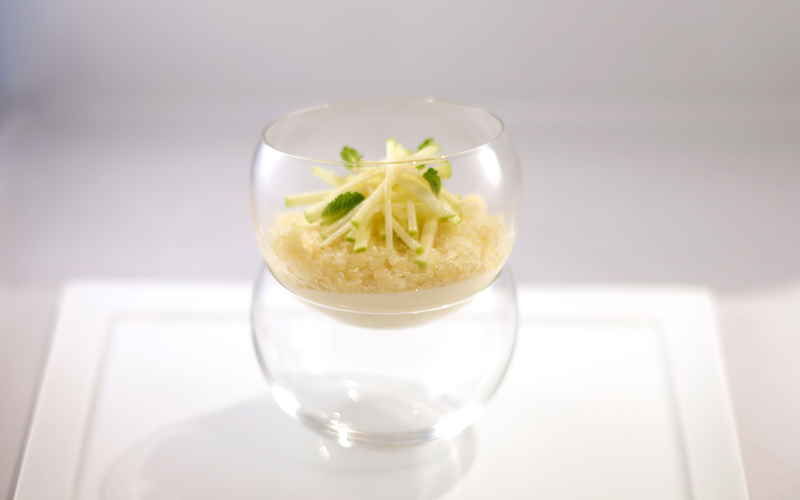 Almost unconscious from the food, we still had dessert to look forward to and on the cards were the Panna Cotta alled Mele Verdi- Panna cotta with green apple Granita and green apple salad and the Tiramisu. 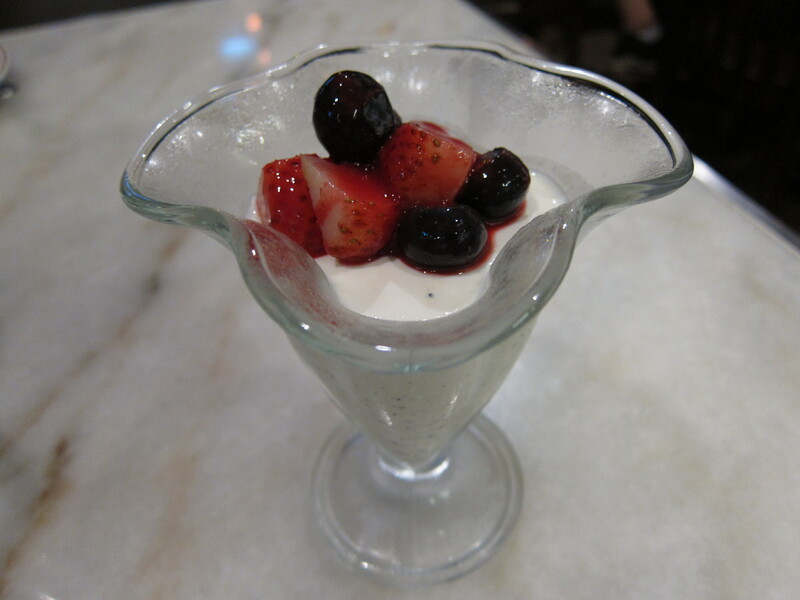 The Panna cotta was fantastic. I’ve never had one with a green apple compliment and it was amazingly refreshing and not too sweet. 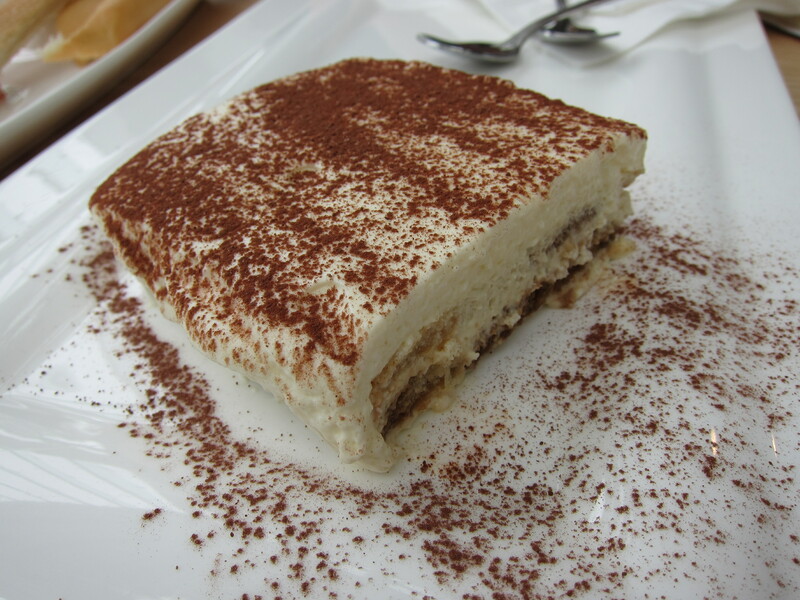 The Tiramisu was also a triumph. 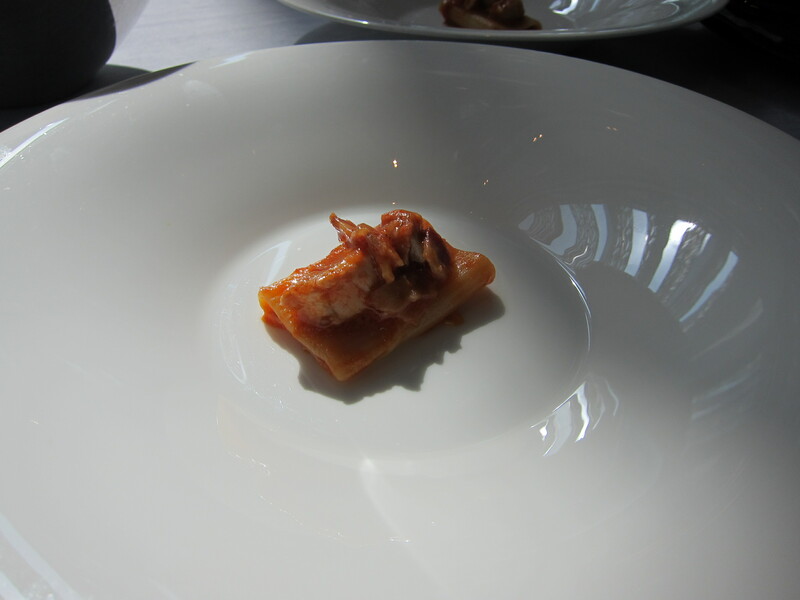 A classic dish that can sometimes be weighed down by too much liquor, W52’s version was scrumptious and not too strong. 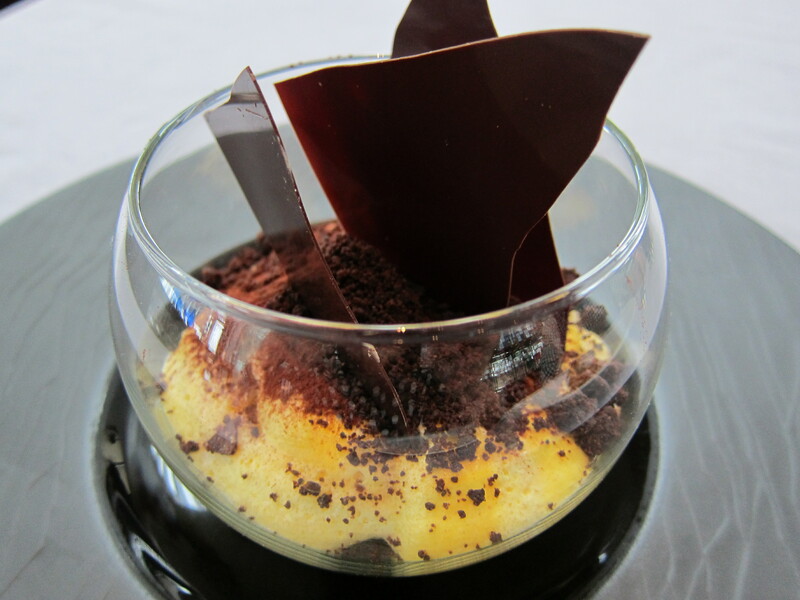 The coffee flavour was not too overwhelming so even those of you who aren’t coffee fans can enjoy this dessert. I left W52 thoroughly impressed. 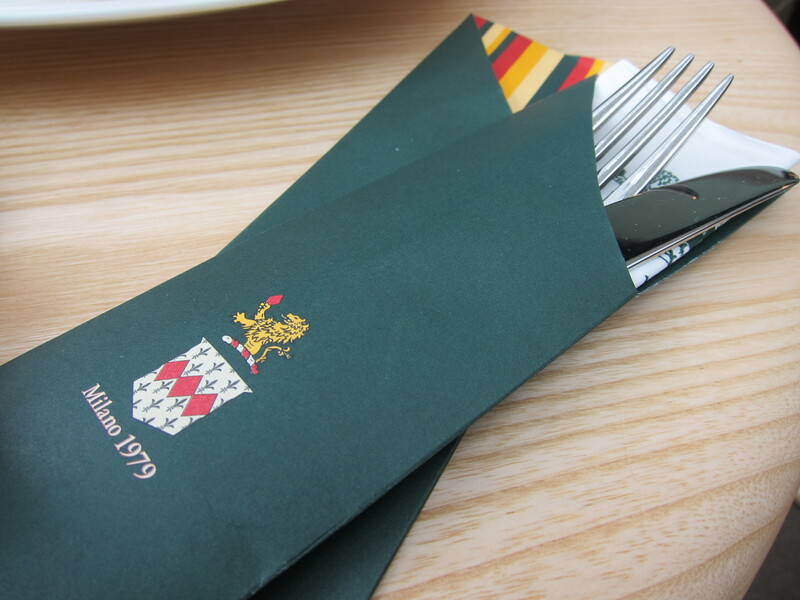 I loved my lunch, the service was impeccable, and the atmosphere coolly laidback. I will definitely be back for more of the gnocchi and to attack the lunch buffet one day. 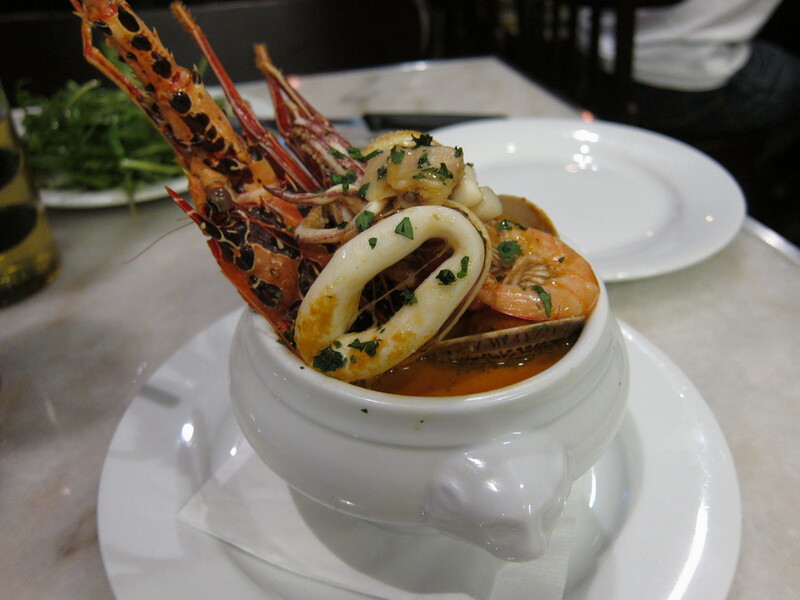 Categories: Italian | Tags: 52 Wyndham Street, Boston lobster, Central Hong Kong, melazane, Pana cotta, polpo bruschetta, tiramisu, W52 Italian, Wyndham Street | Permalink.